Artists love to explore the myriad textures and colours of distressed urban infrastructure. Urban decay reminds us of the honesty and simplicity of days gone by. It is also a reminder of the cycle of life where eventually and inevitably, nature reclaims all. Similarly, in the rural environment where space is not a consideration, buildings and machinery which have exceeded their use-by dates are consigned to a paddock behind a farm house or shed and left to decay. While old motor vehicles are often stored in an urban shed or backyard for “later restoration” which may never eventuate, it seems to me that old farm equipment is often placed as one would place a piece of sculpture. The seemingly complex tangle of rusted iron and steel can resemble a contemporary sculpture, and its placement along the driveway to a farm house suggests an appreciation of cultural elements above and beyond the simple management of fields and animals. While it may not be obvious to the farm visitor, these rusty relics evoke a past filled with horses and bullocks which were the farmer’s living companions and shared the muddy fields and tracks with him. Today’s four-wheel drive multi-function tractors with air-conditioned cabs remove the farmer from direct contact with the earth. In this respect, working animals are no longer needed, and that may well be the farmer’s loss. The decaying equipment is a reminder of a different world. This is an exercise in painting in photorealistic detail without being “botanical” in nature. 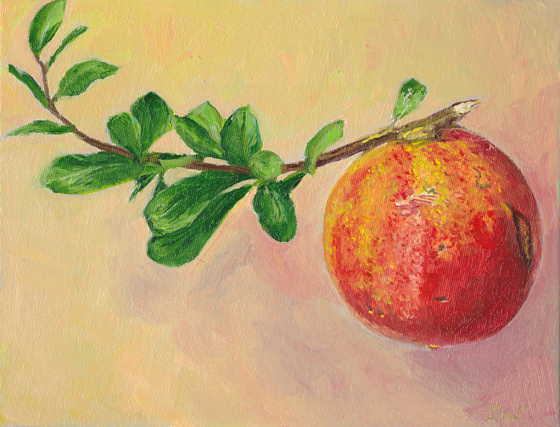 I chose a pomegranate because of all the colours, textures and imperfections in the skin of the fruit. The painting may also cause some viewers to salivate as they recall the delicious, bright magenta pips inside the rugged skin. While Granada is a charming city in its own right, it is somewhat dominated by the Alhambra palace within red brick battlements atop a high hill. This famous Moorish masterpiece is a series of ornate structures amid peaceful gardens, surrounded by ruins of earlier buildings. As one stage of an independent tour of Spain, our stay in Granada was relatively brief. We visited on a bitterly cold morning when mists hung low over the surrounding fields and city below. Our memorable coffees from a stall in the palace grounds were steaming hot and we warmed our fingers on the paper cups as we waited in line. Inside the palaces we were charmed by room after room filled with ornately painted walls in a style normally prevalent in the Middle East. These rooms were punctuated by garden spaces filled with palms and reflection pools. My artistic aesthetics were excited by the rustic red brick and stone walls representing generations of construction over the centuries. 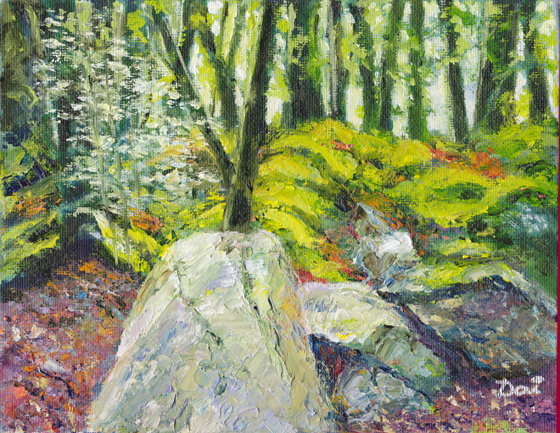 What wonderful colours and textures contrasting with the verdant grass and spindly branches of bushes and trees. A short train trip from Barcelona and an amazing funicular ride lead to Montserrat, a huge formation of the most intriguing white rocks towering above the surrounding flat landscape. On a ledge below the summit is a large monastery and church featuring a black virgin in a gilded glass case. For a relatively small landmass with a very small population, New Zealand is an absolute gem of a country. Brim filled with natural wonders, it offers verdant landscapes, azure bays, hot springs, active volcanoes, snow clad mountain ranges, dripping rain forests and mirror still lakes. In the South Island, there are vast tracts of forested mountains where one can literally lose oneself. Fiordland is one such area, named for a series of deep inlets in the west coast – Milford Sound being the best known. The Milford Track is arguably the most famous of the many spectacular walking tracks in the South Island. It runs from the head of Lake Te Anau, reached by ferry from the Te Anau township, and heads up to the Mackinon Pass to Milford Sound. The walk takes several days, but is punctuated by a series of “huts” which offer a range of cooking and sleeping facilities from basic to first class. 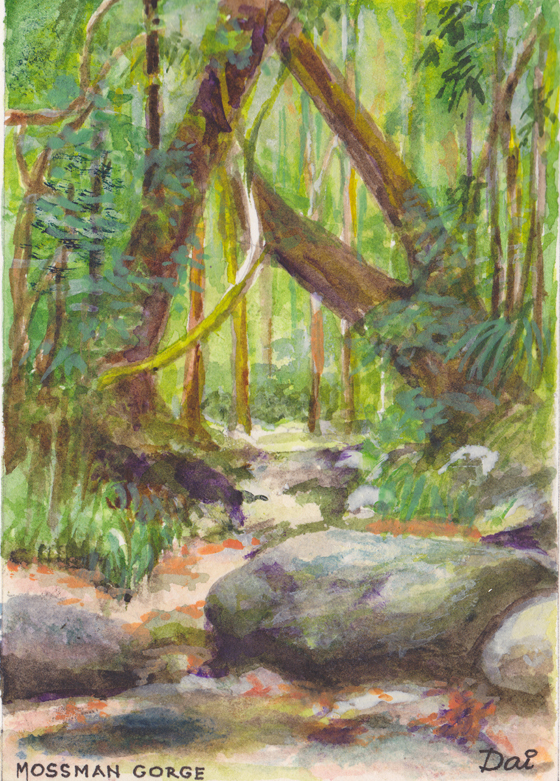 The Glade Burn is one of several streams and rivers a walker might meet along the Milford Track. Another is the Clinton River, which is followed closely by the track in its early stages. The river water is so pure that the surface resembles clear glass. Another celebrated walking track is the Routeburn, reached by following the arm of Lake Wakatipu beyond the hamlet of Glenorchy. One of my favourite towns in the South Island is Queenstown, arguably the Adrenalin Capital of the world. This is where bungy jumping started; where jet boats skim over rocks and white water in narrow gorges; where people parasail from high places; where heli-skiing is all the rage; and all in the prettiest scenery on earth. 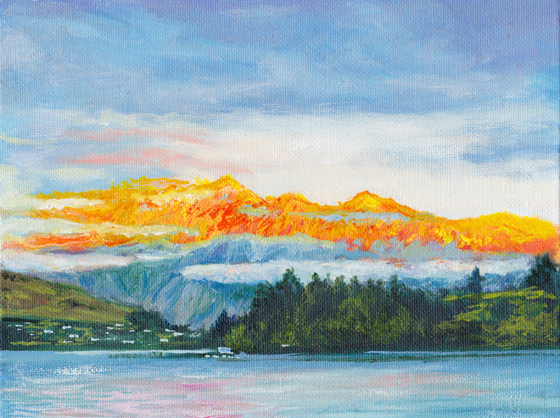 Lake Wakatipu rises and falls like the sleeping Maori maiden and the majestic Remarkables live up to their glorious name. A little to the north of Queenstown in Otago is Lake Wanaka, and at its northern end is the Matukituki River. From a car park beside this river, a walk climbs towards the Rob Roy Glacier. 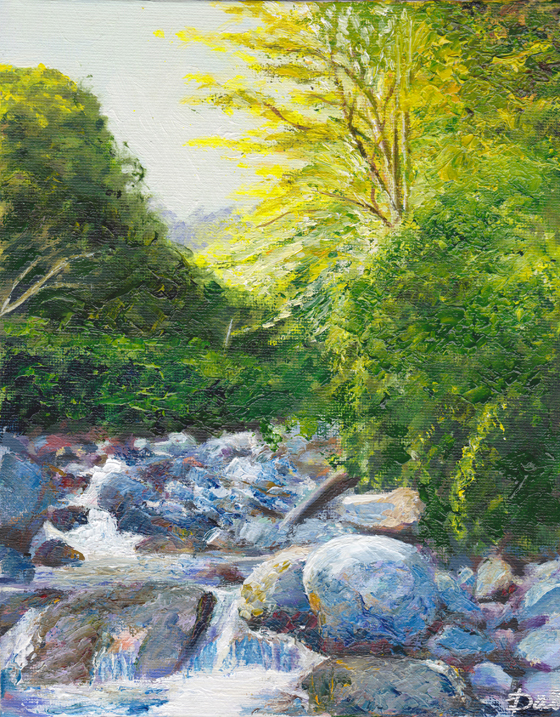 A rushing stream descends beside the forest track and into the sun-drenched valley of the Mount Aspiring National Park. Like all good artists, I have boxes filled with both oil paintings and watercolours. In the main these are small works and have been painted over a period of many years. Naturally as one’s skills improve over time, there is a strong temptation to revisit certain works using techniques learned more recently. 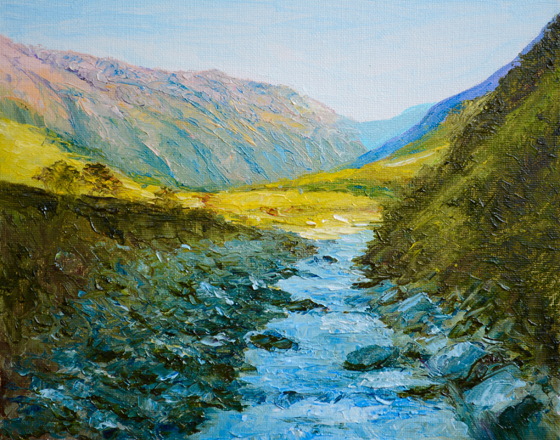 For example, the use of a small palette knife is helpful in defining sharp edges in a painting’s composition, and is absolutely essential when rendering random surfaces such as rocks and boulders. The thin metal blade of the palette knife will yield just so far, but will then skip over the rough underpainting. In contrast, a brush will tend to follow the surface resulting in a more even stroke. 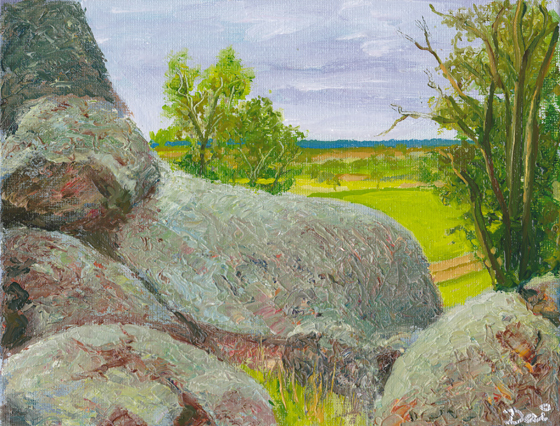 Another example of the use of a palette knife and paint applied thickly is in emulating the texture of lichen on rough granite rocks. The painting of Dan Morgan’s Lookout was originally rather flat and lacked depth and detail. 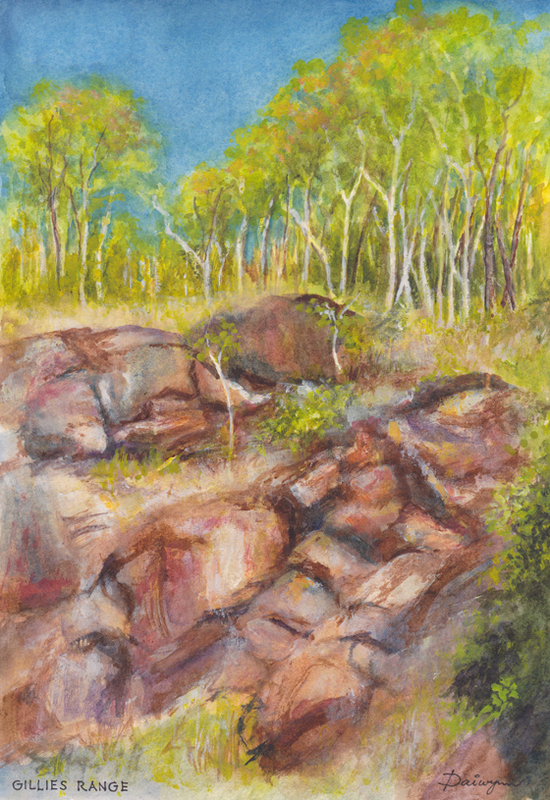 Given that rocks have wonderful surfaces, made even more colourful by hosting plant life, and are the main subject of this painting, it was necessary to develop a technique to bring them to life, so to speak. Oil paintings tend to benefit from many layers of paint, not simply to build up texture, but to lend depth to surfaces by the use of contrasting colours in underpainting. In my opinion, there is nothing more boring than a flat expanse of a single colour, free of brush-strokes. All the classic artists broke up large areas such as sky using strong brush work in random directions. More recently I have been employing very small rigger brushes to add a lot more detail to older works. The result is that the artwork can be viewed at closer range and so speak more clearly to the viewer, rather than having to remain at a distance to be coherent. As I have always said, my paintings are never finished until they are hanging on the wall of a collector well out of my reach. On the basis that any oil painting will benefit from a little extra colour, texture, detail and coherence, I will continue to finesse older works. I hope that viewers will enjoy my efforts. 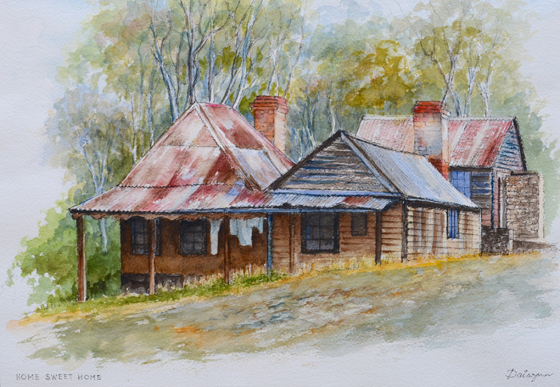 In early November 2015, Anne and I spent a very pleasant week in the Central Victorian Goldfields, making daily round trips in the area from our base at a resort in the Ballarat southern suburb of Sebastapol. This district was a hive of activity in the 1850s where thousands of gold miners came from all over the world to pursue their dreams of instant wealth. As permanent testament to this economic boom, imposing thick-walled banks, bluestone churches in gothic style, colonaded free libraries, magnificent town halls, substantial hotels and architecturally suburb post offices still stand today, albeit as wards of the National Trust. Clunes is a wonderful example of a goldrush town in which there are four banks, three churches, a town hall, a library, a post office and very little else other than a row of dilapidated second-hand book shops. One assumes that miners in the 1850s lived under canvas, so that there is precious little evidence of permanent housing from that era. Today’s farmers live on their land and are more mobile than their forbears, so that they have less need for local services. Fortunately for the town’s few residents, tourists flock to the area to learn about its history and to scour the bookshops and antiquarians for bargains. What tends to make the Australian countryside different from Europe, for example, is that here there is no lack of space. Townships comprise a straggle of shops straddling the highway, surrounded by a sprinking of houses and sheds for perhaps a two kilometres radius. Among the disparate clusters of buildings, one inevitably finds rusted car and trucks, farm machinery, sheds and out houses. I have never seen so much rusty red corrugated iron roofing. On the other hand, among the hectares of dross there are absolute jewels. Old red brick cottages absolutely redolent with history, colour and texture, just pleading to be painted on canvas before settling in to the earth from which their fabric once came. Weatherboard cottages built by a series of owners and extended as new or pre-used materials came to hand. That the timber has never seen a paint brush helps the habitation merge with its forest surrounds, while reminding the viewer that several decades still remain before its owner moves out and it finally shares the dry soil with forest litter. It’s around 3,000 kilometres from Melbourne to Cairns in Far North Queensland and a little over three hours’ direct flight. The flight path is essentially due north from the bottom of the Australian mainland to almost the top at Cape York. Looking down from the aircraft, one sees the red earth of outback New South Wales and Queensland before the lush tropical greens of tropical rainforest and World Heritage national parks as one nears the coast. On the return journey via Brisbane, the view from the aircraft window is of a spectrum of aquamarines and blues as the Great Barrier Reef reveals its islands, atolls and reefs. Cairns is the largest city and is an adventure hub offering fishing, scuba diving, reef exploration, helicopter flights, parasailing, sky diving, rainforests, chairlifts, an historic mountain railway, and a plethora of tourist magnets including a butterfly farm. The warm climate attracts young tourists from around the world; the proximity to Asia makes Cairns an easy destination. Along the coast to the north of Cairns is a string of resort towns on beautiful sandy beaches, including Port Douglas with a number of five star hotel resorts. Large motor launches in the marina and beautifully landscaped golf courses speak of well-heeled visitors. This area of far North Queensland is defined by its sugar cane plantations with a large network of narrow-gauge cane railways and the northern end of the Great Dividing Range clad in dense tropical rainforests. Just north of Port Douglas is Mossman Gorge where the fast flowing Mossman River flows through a boulder-strewn gorge in dense rainforest. This area is managed by the local indigenous people and a series of well-defined walking trails allows tourists to enjoy the forest and its bird song with a background of rushing water. 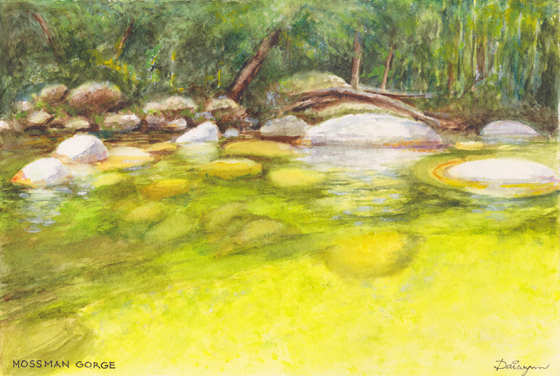 The swimming hole here reminds me of the Clinton River beside the Milford Track in New Zealand’s South Island Fiordland. The water is clear right to the sandy bottom. Boulders are clear to see above and below the prevailing waterline. Despite the huge numbers of visitors, the area appears unspoilt. The slight tinge of green in the water is partly due to tannins and partly a reflection of sunlit green foliage of the rainforest trees. The yellow hues are added by lichens and the river bed sands. A delightful day’s drive from Cairns up to the Atherton Tablelands starts from Gordonvale and climbs steeply in a narrow, winding road up through the Gillies Range. On one side of the road is a magnificent panorama down to the coast, and on the hillside are many outcrops of huge coloured boulders. The road finally emerges from rainforest and crosses grassland to Yungaburra and Atherton. Heading north, the road runs through the coffee plantations of Mareeba, before the descent into rainforest on the Great Dividing Range and Kuranda where the railway and chairlift meet, bringing hordes of international tourists from the seafront to shops filled with Australiana. 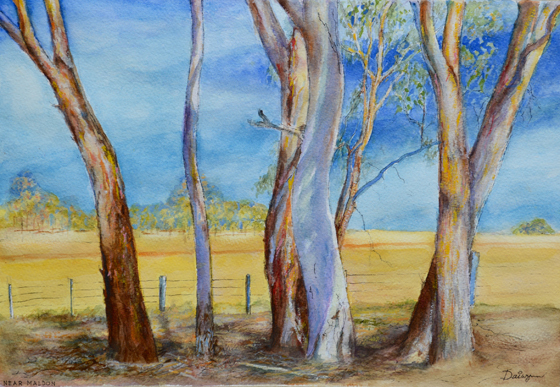 My studio is located in Eaglemont at the foot of Mount Eagle, birthplace in 1888 of the renowned Heidelberg School of Art. 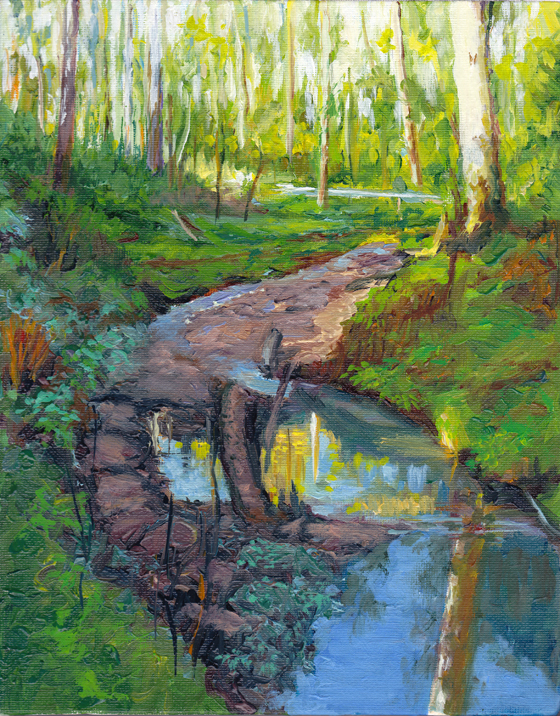 Founded by Arthur Streeton and Walter Withers, it promoted plein air painting and has latterly been described as the school of Australian Impressionism. Other famous names in the Heidelberg School included Tom Roberts, Charles Conder and Frederick McCubbin. 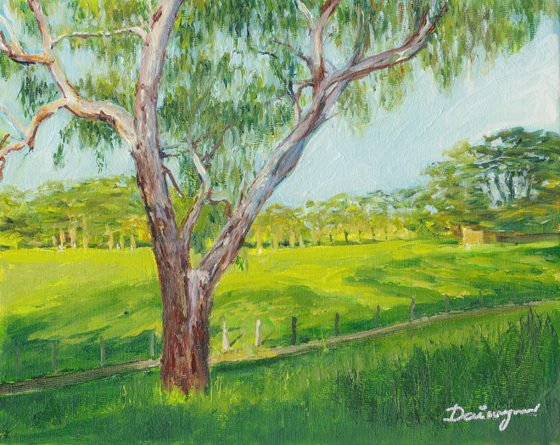 A large number of interpretive hoardings around Heidelberg and neighbouring Eaglemont show the locations where well-known art works were painted en plein air. Many of these are to be found on the banks of the Yarra River and on Yarra Flats between The Boulevard and the main Yarra Trail for walkers and cyclists. Despite The Boulevard being the continuation of the riverside road commencing close to the city of Melbourne, the Eaglemont section has been left in a pot-holed, kerb-free, rustic state which suits those residents whose properties look down on the river meadows where horses graze. No vehicle would dare to exceed a walking speed on this narrow, rough track just metres from suburbia and a very short stroll from my studio. I always enjoy painting flowers. It isn’t until one looks closely at the fine structure of a flower that one appreciates the beauty and complexity of the bloom. The subtlety of hues; the unexpected blushes of colour on petals; the bright come-hither splashes of color inviting pollinating insects to do their assigned tasks. 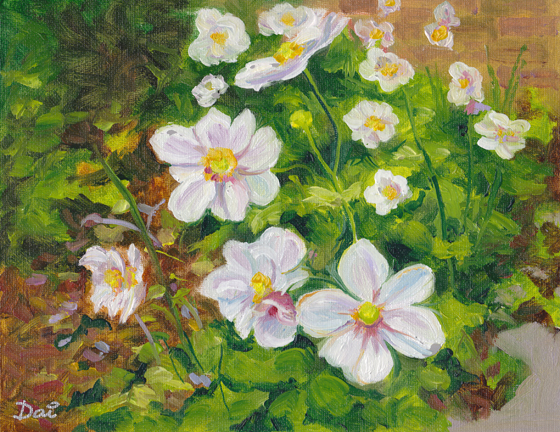 Almost all floral paintings are joyful, and I have used bright colours, even in otherwise dull backgrounds. 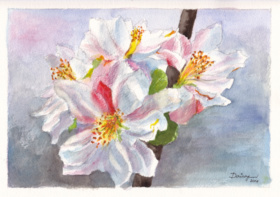 However, in “Fruit Tree Blossom”, I have tried to accentuate the white blossoms by contrast with a very dark background. Normally, like the Impressionists, I avoid using black, and paint with Sepia very sparingly. 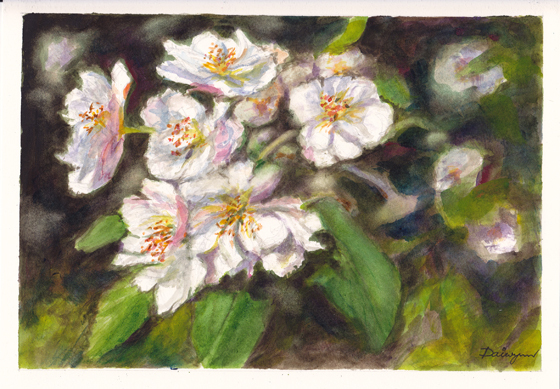 Here I have used a combination of Australian Leaf Green (Dark), Prussian Blue and Sepia to create a background of shadows, hopefully to accentuate the subtle whites, pinks, blues and mauves of the blossom petals. 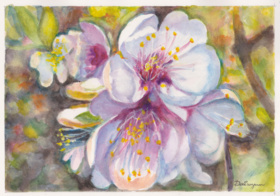 To bring back colour to pretty pink blossoms, and to suggest many more buds and blooms in the composition, I have painted another fruit tree, this time with a kaleidoscope of colours in a slightly blurred background, accentuating the delicate cluster of flowers in the foreground. 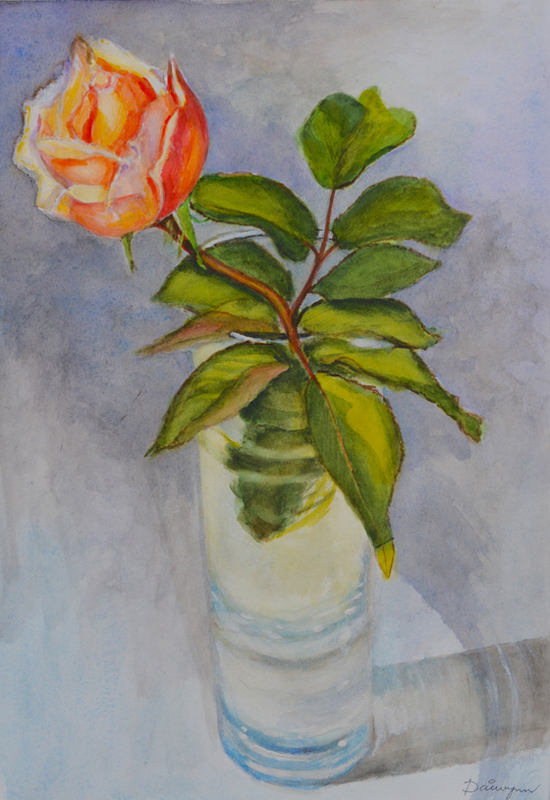 The painting of a rose in a glass vase on my studio desk is slightly more subtle and is much larger in size. Here I have tried to paint a glass vessel with all its attendant optical effects. 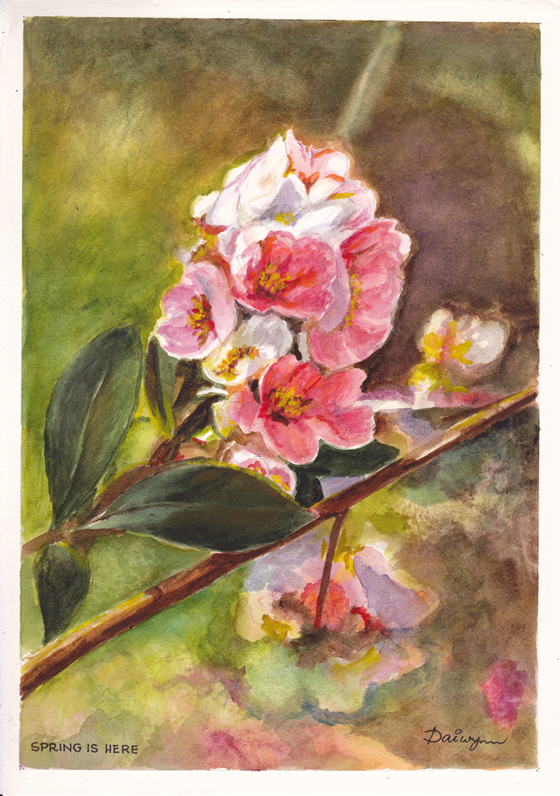 The background is as simple as needs be to emphasize the flower and its sunlit foliage. Despite the fact that floral paintings receive fewer visitors than, say, paintings of Paris or Venice, I quite like painting flowers. 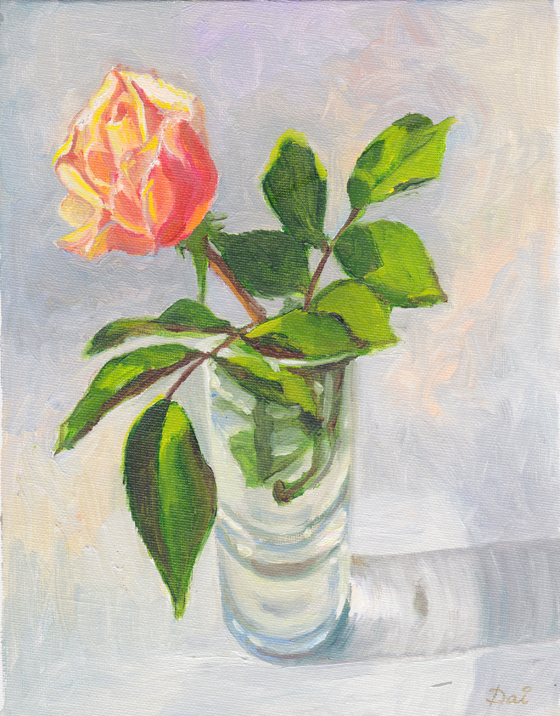 So much so that I have painted the same rosebud in a glass vase; this time at a different angle and this time in oils on canvas panel. Toulouse is the fourth largest metropolitan area in France, after Paris, Lyon and Marseille. As the aero-space centre of France, it is where my former workmates now live, having moved from Vélizy-Villacoublay, a western suburb of Paris. Thus, Toulouse is a city I now visit regularly. Toulouse has many older buildings constructed of pink coloured terracotta bricks, and is often called la ville rose (the pink town). According to Wikipedia, Toulouse has two World Heritage sites, the Canal du Midi and the Basilica of St. Sernin, the largest Romanesque building in Europe. St. Sernin was designated because of its significance to the Santiago de Compostela pilgrimage route. Other interesting facts, not necessarily related to visual art, are: Toulouse with a population of 1.25 million is the home of Airbus, the Toulouse Space Centre, Intel, the Galileo Positioning System, the SPOT satellite system, ATR (regional aircraft), and Europe’s busiest air route between Blagnac and Paris-Orly. 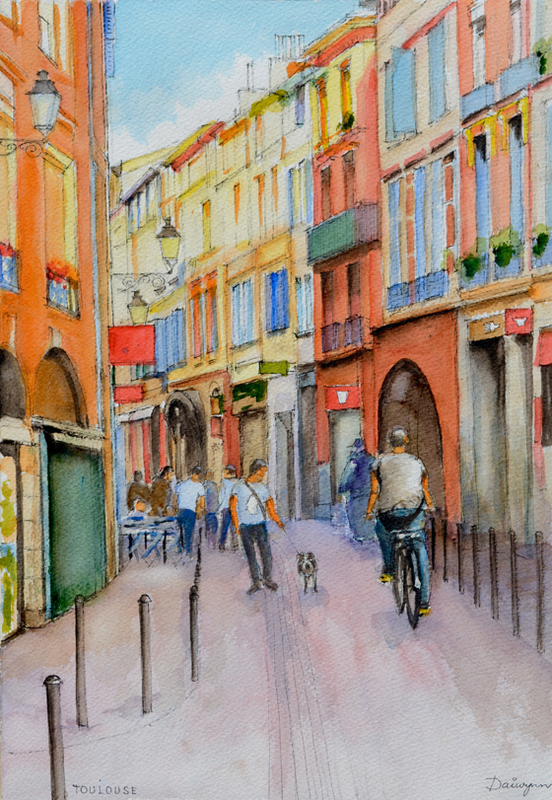 Toulouse, on the banks of the Garonne River, has one of the oldest universities in Europe, founded in 1229. 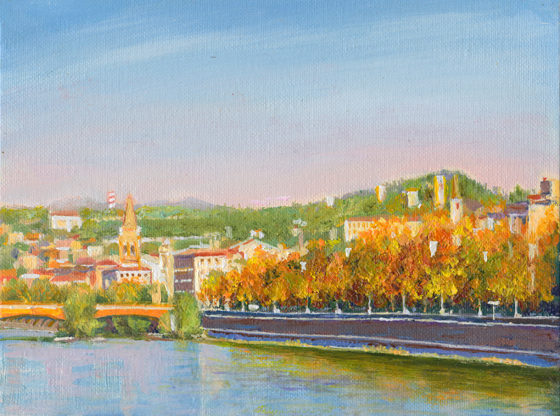 Toulouse is the capital city of the Haute-Garonne département, and the Midi-Pyrénées région. Our base for a week of touring the Auvergne was Château de Maulmont at Randan, not far from Vichy on the River Allier. We had flown in to Clermont-Ferrand and had driven the short distance to the magnificent château in which we enjoyed a spacious apartment. Our day trips from Randan included Billy with its ruined castle, Souvigny with its abbey and stone village, Moulins featuring a magnificent clock tower and half-timbered buildings, Maringues and its tanneries, the pretty spa town of Vichy, Le Mont Dore where the Dordogne River rises, and the Volcanic Park where we climbed the gravel track to the summit of Le Puy de Dôme to watch parapentistes run off the cliff and to glide down to the car park. The Auvergne region of Central France is a very pretty area with two large Parcs Naturels Régionaux, heavily forested and featuring the remnants of prehistoric vulcanism. Løkken (pronounced Lerken) is a delightful seaside village in Jylland (Jutland) in Denmark’s west. Situated on the North Sea, it has beautiful wide beaches of white sand and plenty of wind to drive the wind turbines. The village is protected by tall sand dunes covered in hardy grasses, punctuated at frequent intervals by World War 2 concrete bunkers. Løkken is north of the attractive city of Aalborg on the shallow Limfjord which bisects the Jylland peninsula. Further north through flat cattle farming land, with the ever present wind farms, one arrives at Hjørring, a modern commercial city. 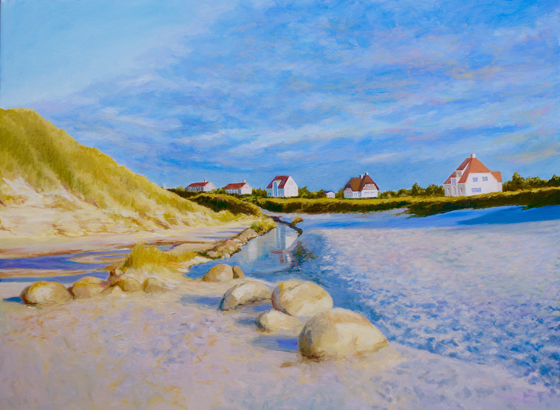 On the North Sea coast is Hirtshals, a ferry port and at the end of a narrow peninsula is Skagen overlooking Skagerrak, the body of water separating Denmark from Norway and Sweden. On the east coast facing Kattergat is Frederikshavn offering a ferry to Gothenburg in Sweden. This is delightful farming country with lovely sea vistas and inland waterways, punctuated at intervals by modern towns and cities. Nothing in Denmark is old by European standards. When in London, my wife and I are very fortunate to stay in a charming apartment in Putney, south west London. At the top of Putney Hill, which runs south from the Thames, is Putney Heath and on the other side of Kingston Road, Wimbledon Common. Both of these huge areas offer vast stretches of forest and grassland, duck ponds, walking tracks, formal sports grounds, golf courses and a stream called Beverley Brook. While much of these non built-up areas are maintained, there are still large tracts of woodlands, criss-crossed by gravel tracks used regularly by walkers and joggers. Strolling through these stands of oak in the late afternoon on a warm sunny day is a pleasure, particularly as the lowering sun shines through low hanging branches and lights the shiny leaves of the under brush. In the distance, the ever present sounds of suburbia remind me that this is an island of (almost) pristine nature in a very big international city. A place which has been romanticised in song, Sorrento is effectively a suburb of sprawling Naples in the shadow of Mount Vesuvius. It can also be viewed in a more positive light as the gateway to the Amalfi Coast and its famous winding, cliff-hugging road beneath craggy mountains. “See Naples and die” is an age old suggestion that Naples offers everything one would ever want to see on this planet. Along with the history, architecture, cuisine, and scenery, Naples has a lot of poverty, crime and grime. The Comorra branch of the Italian Mafia has a lot of influence in Naples. 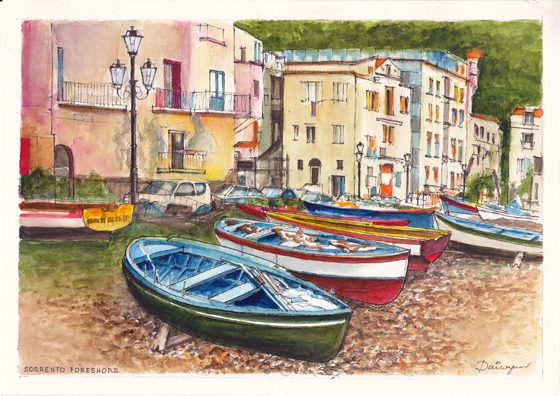 From an artist’s perspective, the interesting part of Sorrento is its pebble beach and harbour at the foot of towering cliffs. Everything here seems to be painted in the brightest colours available, from fishing boats to houses and apartment blocks. The Neapolitans don’t do greyscale. Just look at the graffiti-covered metro trains at Sorrento station. 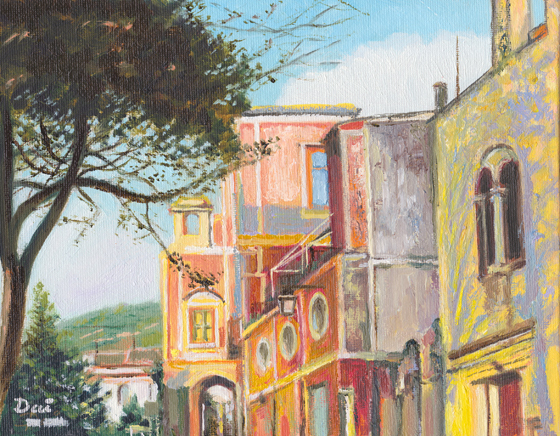 Above all, what makes Sorrento so interesting to a painter is its textural complexity born of neglect. Against a brightly painted wall is a contrasting patch of raw cement; on a faded pink render is a stain from a rusty gutter; on a red terracotta-tiled roof is a green tarpaulin protecting a half-finished renovation; the coarse coloured pebbles on the beach are strewn with discarded blue plastic bags; the high tide line is marked by dark green weeds. Between the fishing boats, propped up by wooden chocks, and the harbourside road jammed with residents’ cars, are the discarded boxes, plastic tubs, wooden pallets and other refuse of no further value to previous owners. Yet, as an artist looking for this decrepitude, neglect and decay in a rich palette of colour, I am always aware of my need to remove anything I think is “ugly” or does not enhance the composition. South of Naples in Southern Italy, Sorrento marks the start of the stunning cliff-hanging road beneath towering cliffs and above the sparkling Mediterranean Sea. Often called the “Mama Mia Road” because of its jaw-dropping vistas and narrow ledges on near vertical precipices, it links a string of fishing villages wedged into tight gaps in the soaring mountains. 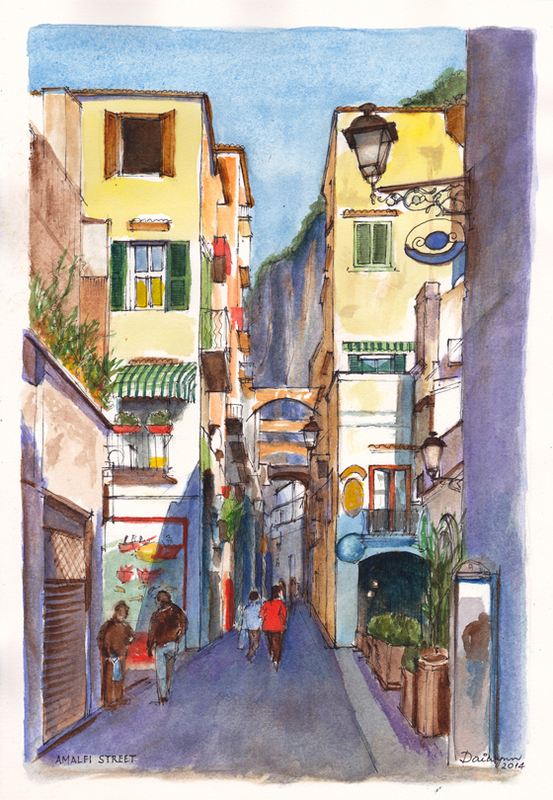 Apart from Sorrento, some of the better-known villages are Positano, Laurito, Praiano, Amalfi, Minori and Paiori. There are many stunning mansions built into the cliffs below the road, most with direct access to private beaches. Often the only way to reach these properties is via a lift from the roadside. These are the getaways of the rich and famous. Above the road and in vertiginous terraces are many vineyards – one has even been planted in a semi-cave. Above the charming village of Amalfi is Ravello with its row of prestige hotels whose terraces offer one of the world’s best views down the coast towards Salerno. There are few better views than a sunset over the Mediterranean, with the villages of Minori and Maiori far below. 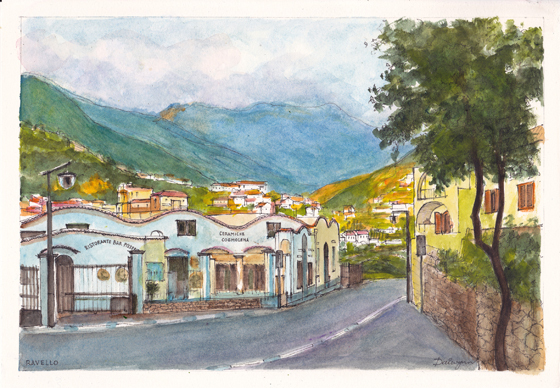 I painted this pizzeria in Ravello for its wavy roofline and industrial-strength security fences. I cannot imagine why they would want to protect pizzas, although the number of motor-bikes parked opposite in the street (not painted) might offer some clues. Amsterdam’s central area, defined by a spider’s web of narrow canals lined by tall leaning buildings, is a fascinating hub of activity. Always alive with people, eating, drinking, walking and playing, the old city is a goldmine of artistic opportunities, particularly on the quays of canals in early evening. The challenge for me in late April 2015 was to capture the last rays of the setting sun as they lit the new leaves on tall trees, bathed west-facing buildings with golden light, and reflected off windows onto selected spots on the opposite darkened quay. 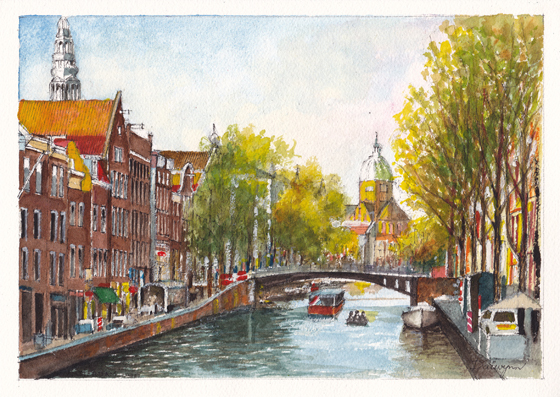 The ink and watercolour painting “Amsterdam in Spring” also becomes a study of a small segment of Amsterdam’s relatively low skyline. Note how many church towers, spires and domes feature in this work. I am always fascinated by how people manage to use every available square millimetre of space when so little is available. The quays on either side of the canal are crammed with people, cars, a worksite, trees, cafés, and clutter. I recently saw a superb ink drawing by Vincent van Gogh depicting a grove of pollarded plane trees and it moved me to draw a converted windmill. 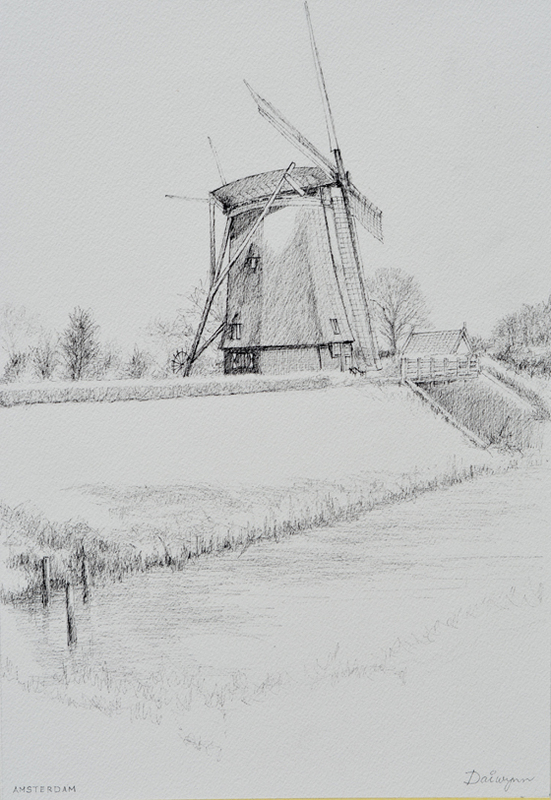 Clearly a major tourist attraction on the outskirts of Amsterdam, it seemed to be an ideal subject for a pen and ink drawing. Miltenberg is a small town on the River Main (pronounced “Mine”) with several narrow streets (Gasse) lined by half-timbered houses. Since the Main-Danube Canal was finally completed in 1992 – having commenced in AD 793 under Charlemagne – Miltenberg is now a tourist stop for river cruises plying the Rhine-Main-Danube waterway between Amsterdam, The Netherlands and Budapest, Hungary. It is rather difficult for the casual tourist in Germany (and elsewhere in Europe for that matter) to determine what is genuinely medieval and what has been beautifully restored after serious WW2 damage. I would hope that Miltenberg was spared by the Allies as providing no military threat. Miltenberg is a charming village and views of the Main River and surrounding towns from a hill above the narrow streets is simply superb. It is typical of the picturesque countryside of southern Germany in which riverside communities are nestled beneath forested hills. This ink drawing was initially planned to become a watercolour painting, but I began to like the black and white patterns which emerged from the rectilinear patchwork of building materials beneath the gardens on the hillside above the rooflines. 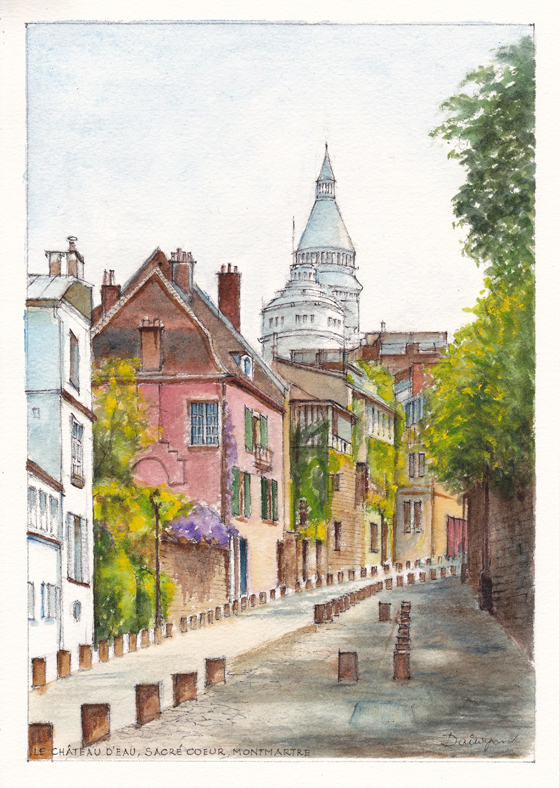 One of my favourite walks in Paris is around the back streets of Montmartre. 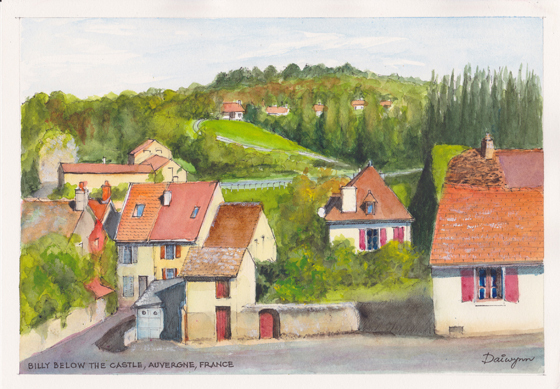 I always avoid the crowds by walking up through the beautiful gardens on the slopes of the Mont, below the forecourt of Sacré Coeur, then through the quiet side courtyard and down the steps to the narrow streets. 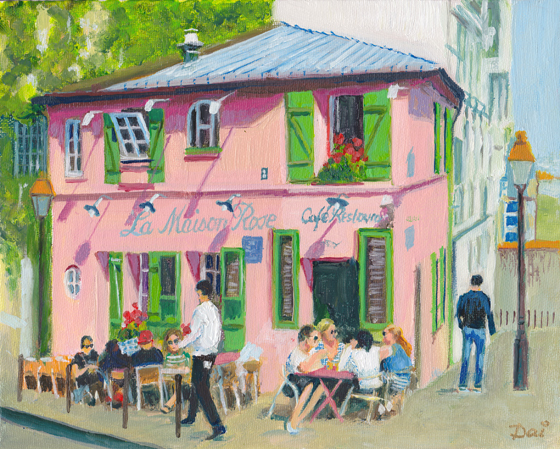 I have painted Montmartre several times, in oils and in watercolours. I just adore the vineyard, especially in Spring when the garden is ablaze with colour and the vines are budding. 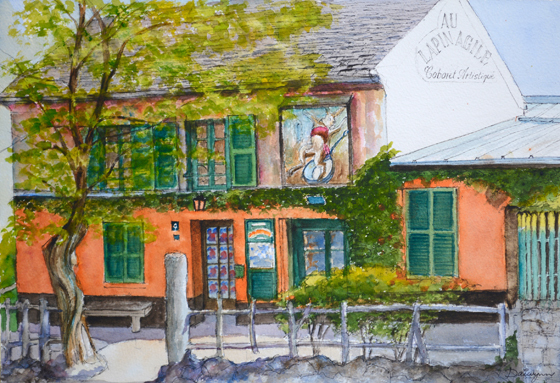 What lies behind the high stone wall on the corner of rue des Saules and rue de l’Abreuvoir? A satellite view shows a tree-filled green space. To whom does it belong? There is another “urban forest” beside the Clos Montmartre vineyard. Delightful. I have walked down rue Saint Vincent many times and have photographed “Au Lapin Agile” on each occasion, but I have never visited La Cimetière Saint Vincent. Indeed, I did not know it was there. Au Lapin Agile – at the agile rabbit – has an interesting mural above its front door. The partly dressed rabbit is struggling out of the cooking pot. I must say I can’t blame it. One can enjoy these wonderful oases only metres from the madding crowds milling around kitsch in all its manifestations. 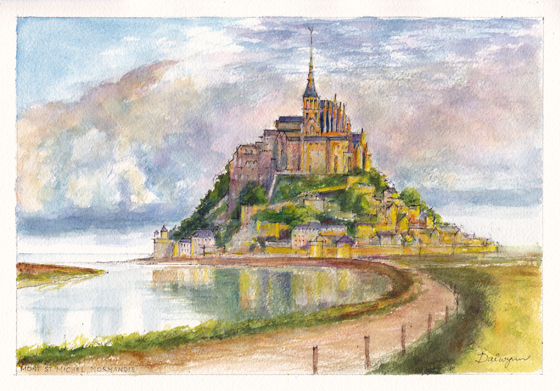 I have painted Mont Saint Michel, 600 metres off the coast of Normandie in north western France several times. If one removes the fleets of tourist buses, thousands of tourists, and dozens of souvenir shops, one is left with a magnificent rock crowned by a huge abbey with a spire supporting a gilded Saint Michel. Around this huge edifice are huddled houses and apartments protected from the open seas by a girdle wall. Mont Saint Michel, viewed from any angle, is a perfect composition against sea and sky. Storm clouds at sunset add an extra dimension of theatre to a superb palette of brown bricks, whitewash, blue-grey roof slates, green foliage and the gold highlights of the setting sun. The setting of Mont Saint Michel on a steep rock beside a shallow river a short walk on a causeway from dry land is interesting enough. The fact that the tides retreat several kilometres from the islet, then advance to cover the causeway, make the place rather special. Finally, recent hydraulic construction just inland is intended to provide a constant flow of river water to prevent silting around the islet. Paris is my second home. It’s the city in which I have spent the most time away from my home in Melbourne. I worked in Paris in the French aerospace industry and have returned to France to see my colleagues every two years or so. My wife and I speak French. Paris is a very big city with a population of 12 million, augmented by 20 million tourists annually. It has a well-earned reputation as a city of romance, and can tell stories of famous artists, writers and performers who eked out an existence in cold garrets above the city’s (almost) unchanged rooflines. Paris is comfortable like a pair of old jeans. I enjoy walking the busy streets through all manner of ethnic neighbourhoods. Thousands of people pursue a livelihood in Paris, speaking dozens of languages. I am ever surprised at the huge numbers of men who loiter outside cafés, bars and markets doing apparently nothing. In many respects tourists associate Paris with its River Seine which bifurcates the city into the Left Bank (Rive Gauche) and Right Bank (Rive Droite). River traffic, in the form of bateaux mouches and working barges, flows under a series of stately bridges, some of stone and others steel. While all are beautiful in their own ways, I love the Pont Alexandre III the best. It is a single graceful steel arch decorated in the most delightful way and flaunts its four stone pylons crowned with four gilt statues. While strolling the quays on the right bank, just upstream of the Alexandre 3 bridge, one passes a number of river barges which are moored (rafted) three deep. One assumes that these are not working boats, but are restaurants, nightclubs or simply houseboats. According to our German guide, Nuremberg was Adolf Hitler’s favourite city and is where he built a coliseum and a stadium to accommodate his thousands of followers. It is also where the famous Nuremberg trials took place after World War II, in which Nazi party officials were tried for war crimes. In the centre of this modern German city lies the Altstadt (Old City) bisected by the pretty Pegnitz River. An intact wall encircles the old town in which many of the streets are closed to motor traffic and open to street markets. As in much of Germany, many buildings have been restored to their former glory after serious damage during WW2. It is always a surprise and a pleasure for me to appreciate the skill and craftsmanship of those who have brought old buildings back to life, improving on their utility while maintaining a sense of history. 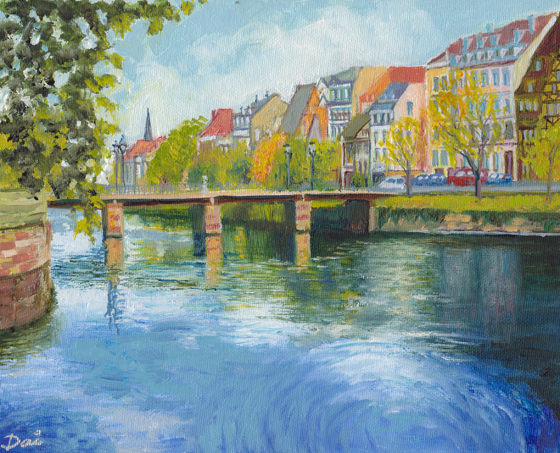 Nuremberg is well served by road, rail and the Donau-Main Kanal (Danube-Main Canal), part of the Danube-Main-Rhine waterway from the Black Sea to the North Sea at Rotterdam. Regensburg is one of many delightful towns in Germany with a medieval old town of narrow cobbled streets on the right bank of the Danube River. The Steinerne Brücke (Stone Bridge) is a famous landmark providing pedestrians with a crossing of two of the three streams of the Danube River. It is currently under refurbishment (April 2015). Other landmarks are St Peter’s Cathedral and the ornate Alte Kapelle (Old Chapel) with its gilt ceiling ornamentation. The Danube streams form three picturesque islands and the main ship navigation channel passes through a lock at the confluence of the Regen River. The town is also graced by other beautiful green spaces which form a semi-circle around the old town, One of these is Schloß Emmeram Park built around Emmeram Castle. While it might seem pretentious, it is possible to visit five countries comfortably in one day. Without border patrols, customs stops or delays. On a September day in 2014, we boarded a tour bus just before 6 AM in Oberstaufen, Bavaria and headed for the Austrian border just a few kilometres south. Passing to the east of industrial Dornbirn in Austria we entered Switzerland and followed the Rhine Valley with Vaduz in Liechtenstein on our left. As the road penetrated deeper into the mountains, we skirted the Swiss city of Chur, then south through the San Bernadino Pass following the Italian border on our left. This is spectacular country with pretty villages, verdant valleys and towering, craggy mountains. A quick look at a map reveals some serpentine road sections, tunnels and soaring bridges. Passing through Bellinzona we drove south in the canton of Ticino in Switzerland which resembles a small peninsula surrounded on three sides by Italy. Interestingly, Campione d’Italia is an Italian commune of the Province of Como in the Lombardy region, and an Italian exclave within the Swiss canton of Ticino, separated from the rest of Italy by mountains. In other words, there is a small piece of Italy entirely within Switzerland almost surrounded by Italy. Russian dolls. 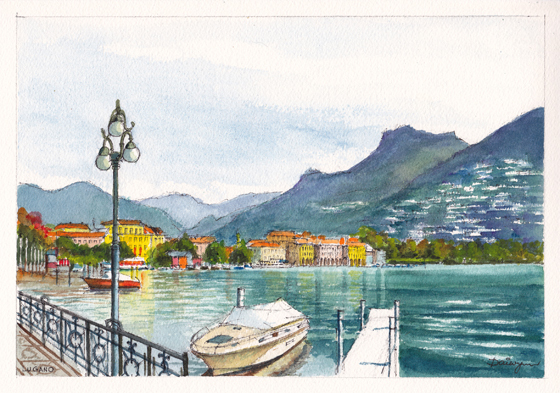 As we arrived at the attractive lakeside city of Lugano, it was time to stretch our legs and take morning tea. Lugano is a delightful town with a beautiful lake front promenade decorated with flowers and fountains beneath stands of Mediterranean pines. Then it was off to the west to cross into Italy and lunch on Lago Maggiore at Luino where we were treated to Italy’s largest open air market. I can now legitimately claim to have visited Italy’s major lakes in Lago Lugano (shared with Switzerland), Lago Maggiore, Lago Como and Lago Garda. All magnificent and surrounded by mountains and colourful cities, towns and villages. In September 2014, Anne and I stayed in the west of Germany, close to the Belgian border, at Gemünd in the Eifel Nature Park. In the rural areas of both countries, as far as I could see, the border was only defined by degraded road surfaces and subtly different signage in Belgium. 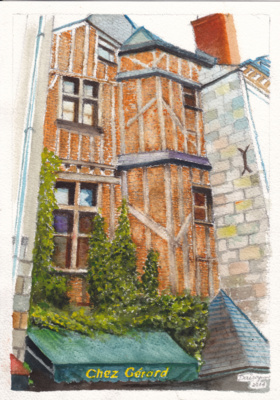 However, small Belgian villages and medium sized towns such as Eupen, with their narrow, winding main streets, were filled with wonderful old buildings. I am always impressed by the locals’ ability to address tourists in German, then French, Flemish and English with the greatest of ease. Bruxelles/Brussels has a cobbled central square, lined with the most exquisite building façades, and filled with entertainers and sideshows. Tree-lined avenues are havens for linear markets on their central median strips, and chocolate and beer shops seem to be ubiquitous. 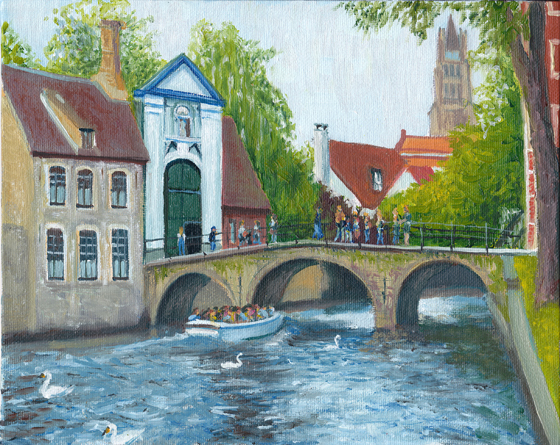 I fulfilled a lifetime desire to visit Brugge/Bruges on a sunny Sunday afternoon, having made a short trip on a fast train from Brussels Midi. 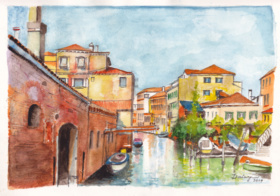 In my mind’s eye I was hoping for a view of placid canals with mirrored surfaces, tree-lined avenues, spacious cobbled squares, and famous churches with lofty spires. In reality, Brugge is seething with tourists, all walking the mainly pedestrian-friendly narrow streets. Except when they are piling into small motor launches for short canal cruises among the nonchalant white swans. Or leaning back in the plush seats of horse-drawn carriages. However, it is possible to find peace and tranquility in the lush vegetation of the parklands beside the Minnewater canal which broadens into a lake. Here in Bruges one finds well-preserved dark timber buildings, old stone gateways, ancient doorways, delightful brick houses with lead-light windows, and soaring public buildings with ornate towers. On landing at Zürich airport one descends to the large underground railway station and uses a process of elimination to select the correct platform. While our later return from Germany required but a single train, this first journey (booked online) required a series of changes at Winterthur, Saint Gallen, Rorschach, and Bregenz before arriving at Lindau. As expected, all regional trains were punctual, well labelled, fast and clean. On a delightful late summer’s day we passed by crowds of beach-goers on Lake Konstanz as we inadvertently crossed from Switzerland, to Austria, to Germany. 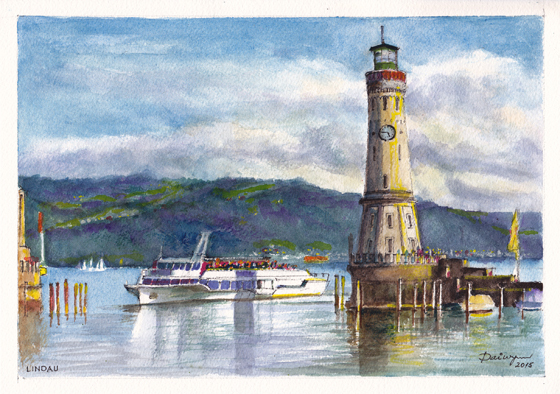 Lindau is a small, largely authentic, historic town on a tiny peninsula jutting into Bodensee. Seemingly untouched during World War 2 (unlike neighbouring industrial Friedrichshafen, home of Zeppelin and Maybach, flattened by Allied bombers), its iconic lighthouse dominates the entrance to its tiny harbour. From Lindau station, one takes a regional train to Oberstaufen through picturesque countryside. Oberstaufen is a delightful village in the Bavarian Alps, south west of Munich and a few kilometres from the border with Austria. It is also a short distance from Switzerland and Liechtenstein. We landed in Europe at Zurich Airport and took a series of electric trains to Lindau on Lake Constance/Bodensee via Winterthur, Saint Gallen, Rorschach and Bregenz. Finally, a diesel-electric set from Lindau to Oberstaufen. Oberstaufen village comprises typical German alpine architecture with red geraniums crowding window boxes and white masonry contrasting with dark wood. Staufenpark is a wide green area in the middle of town with beautiful displays of flowers. The Alpenblick Hotel and resort is situated below the village via a 20-minute walk along a wide footpath. Views of the snow ski areas to the south are impressive and the Imbergbahn chairlift departs Steibis and climbs to a peak overlooking Austria. On the other (west) side of Germany, about 600 kilometres by road, is Gemünd Schleiden, not far from the Belgian border. This village in the Eifel Nature Park is reached by fast electric train from Köln/Cologne via Kall and a taxi for the final 17 kilometres. 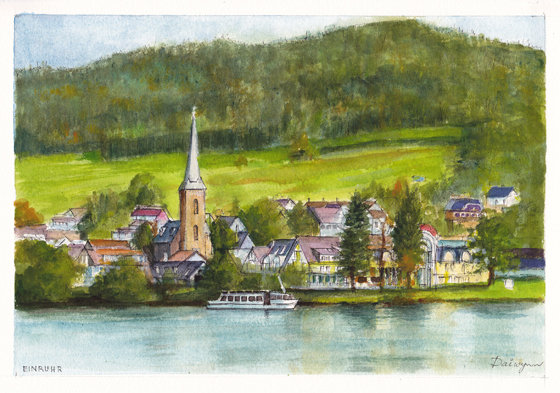 The pretty village of Gemünd lies at the confluence of the Urft and Olef rivers and is several kilometres from the village of Schleiden which lends its name to the commune. The Eifel National Park features three picturesque lakes and the small lakeside town of Einruhr. Gemünd is close to Aachen, Trier and Eupen in Belgium. The area is overflowing in historical sites including Aachen Cathedral and the Porta Nero Roman Gate in Trier. Cologne has a magnificent cathedral beside the railway station and a large central business district and shopping areas. The steel railway bridge over the Rhine River has an immense number of padlocks adorning the balustrade of its pedestrian path. Down below are several dozen cruise boats docked on the extensive quay featuring a wide lawn and cafés where a brass band might be encountered on a sunny weekend afternoon. 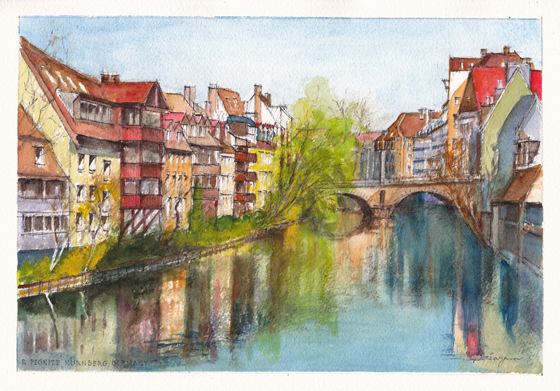 Strasbourg now lies in Northern France, but it was not always French. It lies on the Rhine River separating France from Germany and has a delightful old town famous for its beautifully preserved half-timbered buildings. The old town is threaded by canals of the River Ill which reflect the colours and patterns of the historic architecture. On pleasant Sunday mornings I ride my bicycle around Melbourne’s suburbs. I aim to cover 70 or more kilometres round trip and to spend 3 to 4 hours in/on the saddle. On two occasions I have followed the relatively uneven track which follows the Maribyrnong – Melbourne’s second river after the Yarra. Unlike the Yarra whose meandering course traverses relatively flat country in the eastern suburbs, the Maribyrnong has carved a deep serpentine scar through the less densely populated western suburbs. While new housing estates on the cliff tops look down on the deep river valley, those fortunate people riding or strolling beside the river enjoy a pristine forest of indigenous trees and lush grasses. Native bird songs are occasionally interrupted by the sounds of civilisation on the canyon rim. 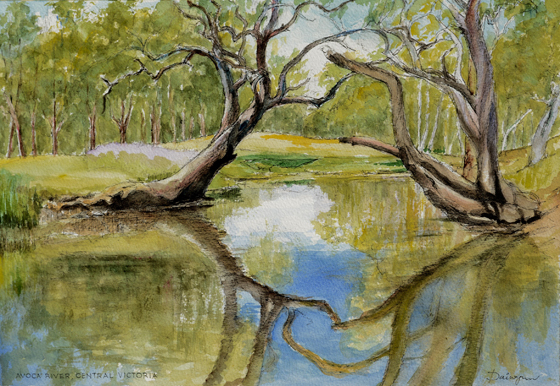 As the early morning sun slants through the red river gum trees lining the river banks, a fisherman sits quietly waiting for the slightest tug on his line, and a racing shell slices cleanly through the mirror surface of the stream. Historical markers on the track remind passersby that the Chinese Tea Gardens once stood beneath the wonderfully gnarled peppercorn tree, opposite the asbestos-riddled red brick and concrete bunkers of the Government Explosives Factory. Further west, toward expansive Brimbank Park, the impressive iron lattice Melbourne-Sydney railway viaduct spans the Maribyrnong parallel to the relatively new Western Ring Road bridge. Another favourite ride is to the east of Melbourne along the Mullum Mullum Creek which flows through native bushland in Ringwood and Mitcham to its confluence with the Yarra River at Templestowe, facing Eltham on the right bank. This delightful patch of bush was about to be torn up for the Eastern Freeway until a large group of concerned nature lovers forced the road to be build through two tunnels. My Sunday ride is best on a misty winter’s morning as the sun’s early rays slant through the gum trees and light the grassy banks of the meandering creek. Since the flow rate is relatively low, the creek bed is often strewn with tree branches and old logs. 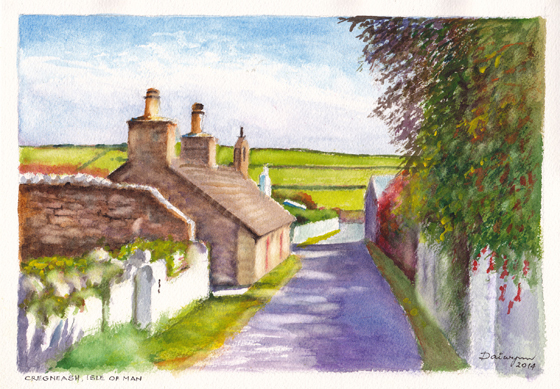 The heritage village of Cregneash somehow typifies the culture of Mann. It occupies the crest of a hill with stunning panoramic views of pasture land, the Irish Sea and the small island on the south western corner – the Calf of Man. It fits snugly in the rural landscape as it has done for eons. No one is in a hurry here. The Isle of Man Steam Railway runs from Port Erin via Port St Mary, below Cregneash, to the capital at Douglas. The gleaming red locomotive with sparkling brass fittings was built in Manchester in 1874 and runs a scheduled passenger service on five days of the week. The Electric Railway – actually a 1900-ish tramcar with open “toast-rack” trailer – runs up the east coast from Douglas to Ramsey via Laxey where one can take another electric tramcar to the summit of Snaefell at 2036 feet. I am informed that a horse-drawn tramcar links the steam railway station with the Electric Railway station. There are some notable exceptions to the laid-back, soporific lifestyle of Mann. The annual TT (Tourist Trophy) motorbike race runs around the centre of the island and over Snaefell. A factory next to the airport at Ronaldsay manufactures ejector seats for fighter aircraft. Several wealthy individuals have luxurious homes on the island which prints its own currency and has a lower tax regime than the UK of which Mann is not a part. I admit being surprised by the number of towns and villages dotting the verdant landscape of the Italian Veneto region west of Venice in the north east of the country. Given the large size of the Italian population and the small size of the country, I suppose I should have expected my average car touring speed on minor roads to be about 50 kph. While built-up areas are relatively compact and surrounded by fields of corn, there are many small industrial complexes scattered across the region. In this relatively mundane landscape, one can discover the occasional jewel in the form of a Palladian mansion, a manicured garden, a placid lake and a Roman hilltop town. Above the modern town of Asolo in the Veneto, one climbs through thick forest to the top of a foothill of the Dolomites and discovers a tiny village with Roman origins. Having expected to park in the township and to pay for a bus ride to the top, we were pleasantly surprised to be able to drive to the central village piazza and park next to the locals. A system of traffic signals ensures an orderly stream of traffic flows along the winding narrow street, one way at a time. As if to educate the visiting public as to the age of the village, over shadowed by a castle fortress, an ancient gnarled plane tree stands beside an interpretive wall board explaining how the Romans brought water to the village via a series of aqueducts. 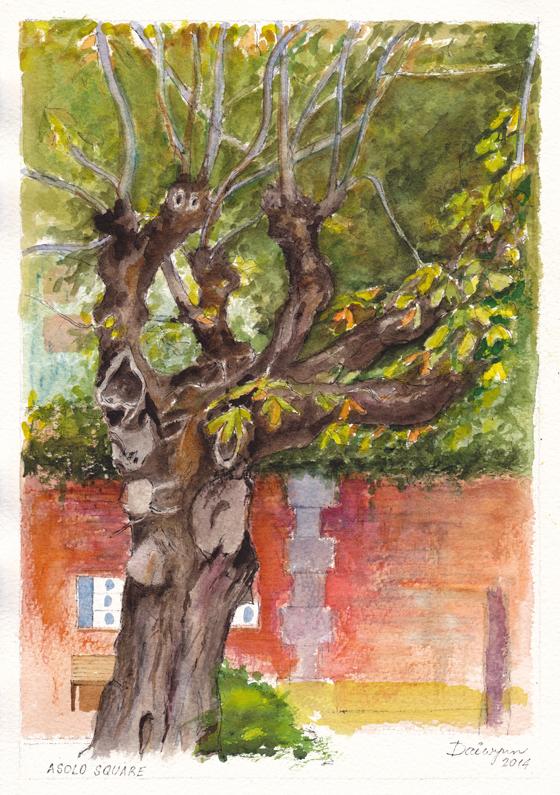 The tree caught my eye because it bore the scars of many decades of pruning, coppicing and shaping. It seemed to be alive and well, with foliage showing the first colours of autumn. Further west, in the rolling hills of Umbria lies the hilltop town of Assisi, made famous by Saint Francis. The church dedicated to his great deeds is a popular destination for busloads of tourists, but the town itself is a fascinating compact collection of red brick and stone buildings lining winding narrow roads, I can imagine that the village was originally fortified as evidenced by heavy stone arched gates and a central ruined tower. Like many Italian hilltop towns, Assisi offers numerous attractive historic buildings whose rough coloured textures contrast with the verdant undulating hills clothed in olive groves. 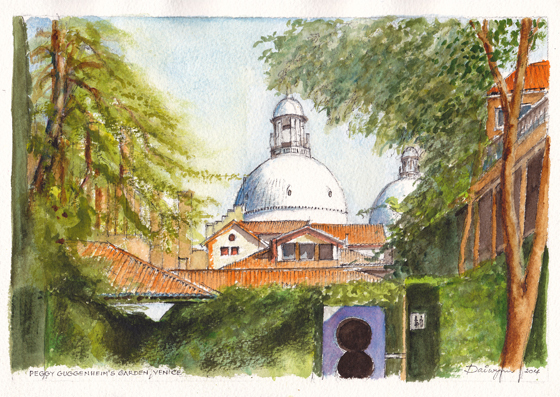 In September 2014, at the end of our five week European trip, Anne and I spent a week in the Veneto region of Italy. We stayed in a converted stables and staff quarters of the Villa Corner – a Palladian mansion – in the small village of Cavasagra not far from Castelfranco. On three occasions we drove our rented Fiat 500 to the capacious railway station car park at Castelfranco and took the rapid train to Venezia Santa Lucia – a 45 minute trip. We then spilled out of the station onto the paths beside the Grand Canal, along with several hundred thousand others. 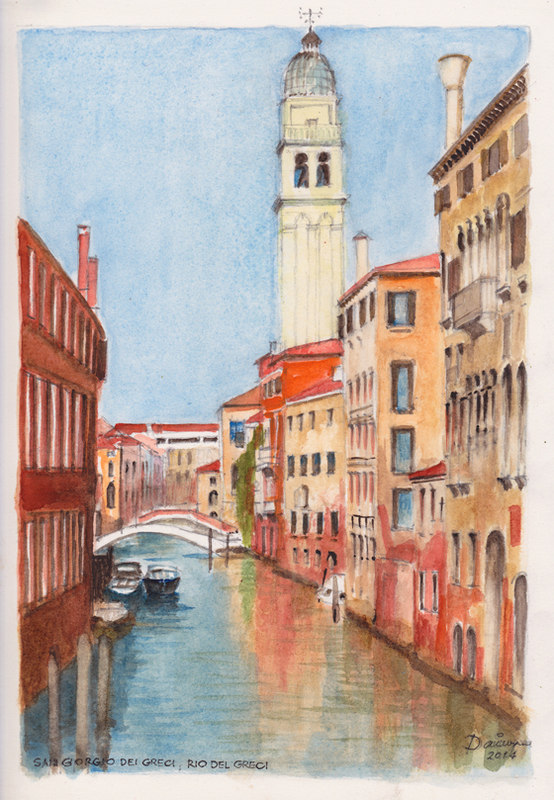 Venice, and particularly the island of Venezia, occupies a special place in my list of eminently paintable places. On our first visit in November 2006, we stayed in the Hotel Principe on the Grand Canal, not far from Santa Lucia stazione. The weather was very warm for late autumn and the skies were blue. In September 2014, we again enjoyed 25ºC and clear skies with a cooling sea breeze. What nicer place for lunching on pizza and wine, sitting beneath an umbrella in a canal-side café while watching the passing parade of people, water taxis, vaporetti, barges and baggage trolleys? 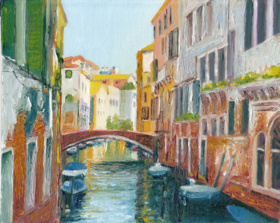 As an artist, I enjoy Venice for its vibrant colours and rich textures. Everywhere I look, I see crumbling building façades exposing red, orange and brown brickwork. I see walls which have been patched over the centuries in diverse colours and textures. The bottom metre or so of exposed walls of palazzi has been darkened by high tide and flood waters. The patina of age is everywhere, and reveals itself in every tiny calle and alley, to such an extent that contemporary, clean-faced buildings look utterly foreign. 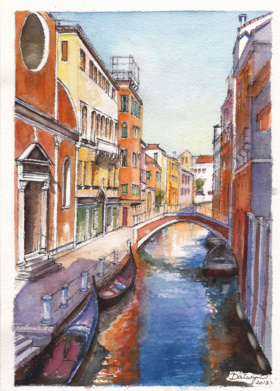 The best thing about Venezia is that almost every scene is reflected in the tranquil waters of a canal, thereby offering the viewer double the pleasure. In a 2 July 2014 article by Paddy Johnson in the Artnet News, the online art and collectibles market will see an annual growth rate of 19 percent over the next four years. Interestingly, studies by the art market research group ArtTactic in conjunction with the insurance company Hiscox Group confirm conventional wisdom about online art sales. A major issue with any online purchase is trust. The unique nature of art adds an extra dimension – since there is only one in the world, there is nothing to compare it with, other than similar works from the same artist. I suspect that buyers often need the reassurance offered by an art professional that what they intend to purchase will be a good investment. The ArtTactic – Hiscox study looked at a number of established online auction sites – incidentally I recognised none, but I am an artist rather than a collector – but these researchers had some difficulty obtaining a consistent set of numerical data on values of annual sales. However, Christies was more forthcoming and showed that they had held a number of successful online auctions with an increasing revenue stream. It could be argued that an auction site with an established bricks-and-mortar reputation will not encounter problems with trust, since it is tacitly implied that they will only sell investment art and that their staff are fully qualified curators. So, rather than trusting an agent at the end of a telephone (hopefully in a convenient time zone) to bid on a buyer’s behalf at a conventional auction, collectors can now bid electronically. How does this translate to the online sale of works of art by Dai Wynn? Selling my own paintings on my website at daiwynn.com limits the number of viewers to a handful who happily arrive via search engines or personal invitation. The PayPal payment facility works well and the website search bar allows a thorough examination of all current and recent paintings and drawings. Exposure on popular international art websites such as Fine Art America and SaatchiArt has produced the occasional print sale, as has Redbubble which seems to concentrate on graphic art for tee-shirts, totes, throw cushions and iPad and iPhone cases. Etsy has offered a constant stream of viewers, but its main emphasis appears to be in crafts rather than fine art. All of these international websites, albeit appealing directly to the North American online marketplace, have huge numbers of members and very wide viewerships. On the one hand this offers wide exposure; on the other hand, competition is fierce. eBay is an international auction website with an extremely eclectic range of items for online sale. While I view it as the “world’s largest garage sale”, it has an audience of millions around the world. Unfortunately, the expectation of the Internet freebie permeates the eBay concept, and associated advertising promotes a world of unbelievable bargains. I personally have great difficulty when the phrases “fine art” and “garage sale” occur in the same sentence (although we regularly read about lucky art collectors finding long-lost masterpieces in antique shops). eBay has recently informed me that I have sold 45 paintings through their website and my customer service has been “above standard”. At the same time, eBay wants me to set a starting price of 99 cents to stimulate bidding, then suggests I offer free postage to the successful buyer. The bottom line is that I sell small works of art at a fraction of their cost price. Better they hang on a collector’s wall than lie quietly in my cupboard, I argue. Nevertheless, it is disappointing. A psychologist might argue that, while a viewer might like a painting for its colours and subject matter, its presence in an eBay auction with a low starting price might suggest it is a print produced somewhere in Asia on inferior quality paper. Alternatively, a realistic price would run counter to eBay’s promise of a give-away deal and beg the question as to whether the fine art is in the appropriate online sales channel. So, I conclude that published statistics supporting the heady growth in online sales of art simply reflect an alternative sales channel for major art auction houses which have already established a reputation in the world of bricks and mortar. I love to paint in watercolours. I find that I can complete an A4-sized watercolour painting relatively quickly, and for me that means 4 – 5 hours over one or two days. 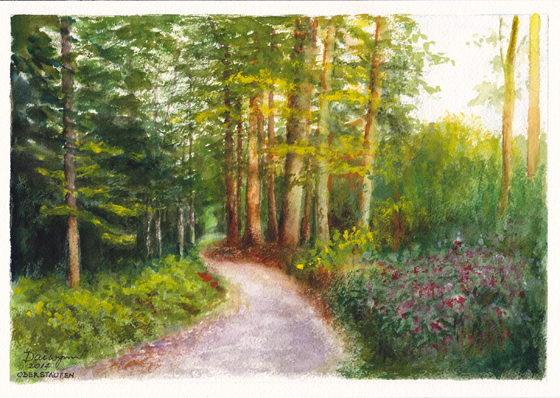 I can achieve subtle variations in colour, virtual texture, and depth of field and, since the paint dries fairly quickly, I can complete the work within hours. Best of all, by using cotton paper, I can remove paint using a stiff bristle brush, thereby adding further textural interest without damaging the paper surface. However, I do have several dilemmas. Firstly, I have not been trained formally in watercolour techniques. 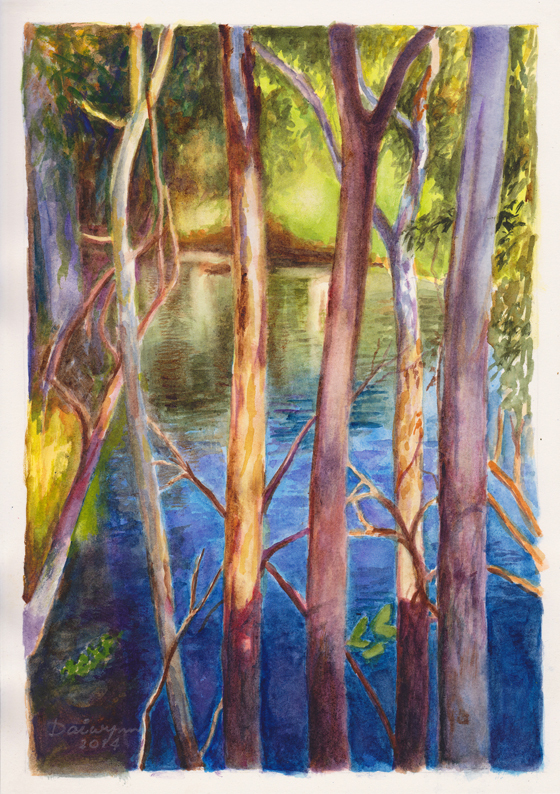 I “look over the shoulders” of those who have done the courses, often conducted by luminaries, and I understand that for many watercolour artists, painting is formulaic. It seems that compositions generally involve a low sun, “contre jour” composition where weak sunlight penetrates a misty background and reflects off foreground objects and people. 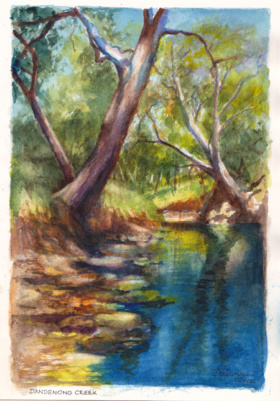 Light and shade are very important components of this technical approach to watercolours. The juxtaposition of warm and cold colours is equally important. 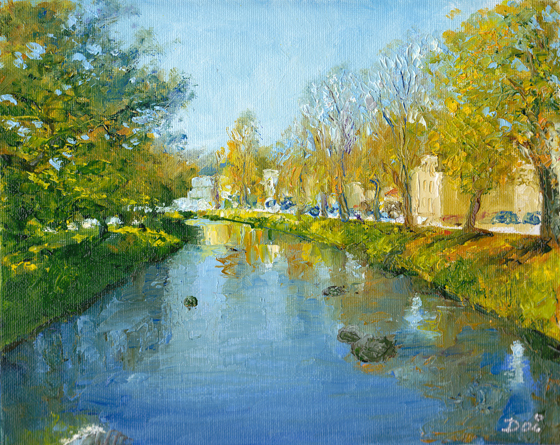 Broad applications of colour in the form of washes are “de rigueur”, as is a “paintbox” filled with tricks-of-the-trade such as dropping pigment into a wet wash, dry brushing to achieve a textured effect, single stroke representations of palm trees and power poles, and various techniques for waves on open water. There are also other materials which can be used to protect the paper surface from paint in order to leave white areas. Such techniques are used to create a painting in the shortest possible time. This is presumably the way “plein air” painters capture the essence of a scene before the light changes too much, or before the weather closes in. 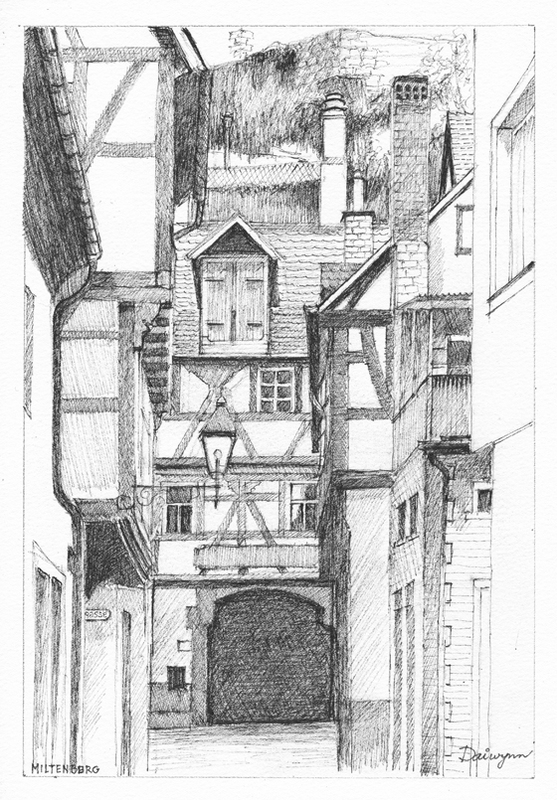 Clearly, if the artist is racing against the clock, there is little room for draftsmanship in his preliminary sketch. Secondly, I assume that the simplicity of a watercolour painting, perhaps allied to a general perception that watercolours fade over time and are easily water-damaged, devalues paintings to a level well below similar paintings in oils or acrylics. 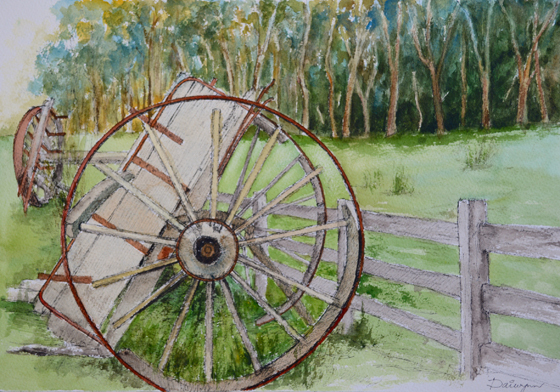 In a circular argument, artists who choose the watercolour medium must therefore ply their craft more quickly in order to create and sell more in a given time. 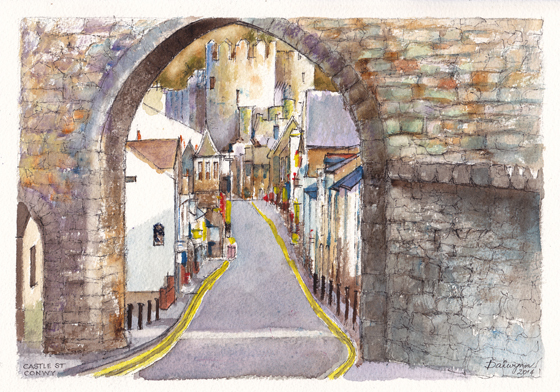 Thirdly, I apologise for my inability to use technical terms to describe the way I paint using watercolours. 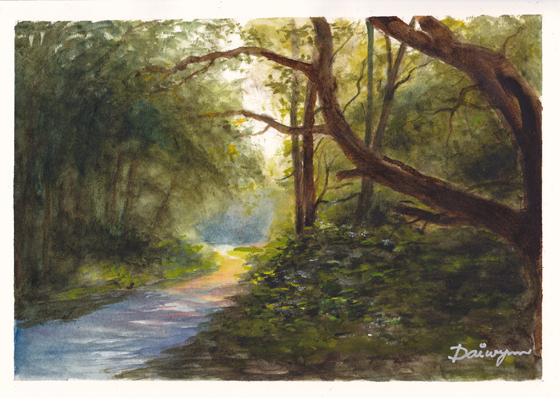 Suffice to say that, while I can achieve a result in a fraction of the time it would take in oils, a watercolour painting of mine is not executed as quickly as possible. I don’t consciously use a formula, or use techniques learned from a book, or in a class. Clearly, I have evolved processes over time, and these have to do with layering of colours to achieve a “textured” surface effect. Another process I regularly use is the removal of paint using a stiff bristle brush and paper towel. In fact, so important is the removal paint as I proceed that I end up with a table full of soggy, spotty, paper towel. My use of a heavy cotton paper means that paint can be removed without damage to the surface. What I do rigorously is to ensure that my layout drawing is a piece of art in itself. 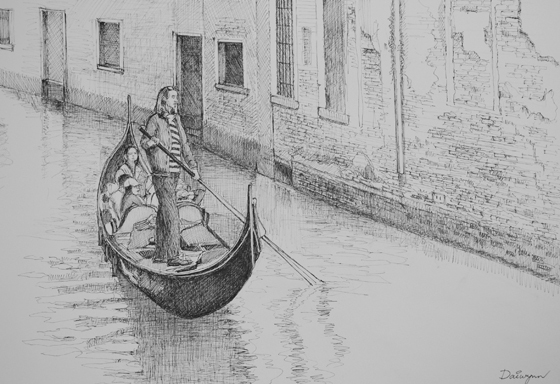 I am an absolute stickler for draftsmanship – as are many famous artists – and have shown my preliminary drawings in both pencil and ink form as if they were finished works. Fourthly, while I greatly admire watercolour artists who derive great pleasure knowing that many collectors initially believed their paintings were colour photographs, I try to tread a line somewhere between the formulaic “quickie” which captures the essence of a scene and a considered, and more detailed, study which necessarily involves “reference” photographs. This is really an issue of viewer involvement – do I ask the viewer to imagine as much detail as he/she requires to appreciate a scene, or do I leave nothing to chance? 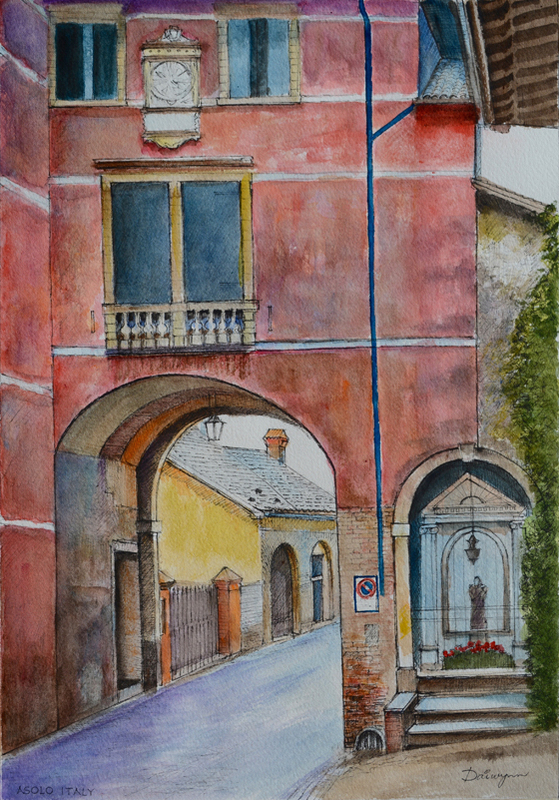 Fifthly, and finally, should I refer to my aquarelles as watercolours or watercolors? I’m really not sure whether search engines on the Internet are sticklers for spelling. While negative sentiment in early 2012 seems to permeate the front pages of our newspapers and economists warn of “tough times ahead”, Australians have reacted by keeping their wallets in their pockets. So much so that retailers are reporting diminishing profits and mounting losses. This has something to do with an increase in online purchases, and in particular buying products from overseas, benefiting from the high Australian dollar. However, it would appear that Australians now prefer to reduce credit card balances, increase savings account levels and pay off their mortgages a little faster. This fiscal rectitude may appear to be a good thing: what you don’t have you can’t spend. But over past decades, retailers have grown used to the general populace spending 10% more than they earn. Now people think twice about whether they actually need a new car, whereas several years ago they wanted to keep up with the Jones’ next door. “What has this to do with art?”, you ask. Well, I would argue that, in the same way that paying off the mortgage on an appreciating asset such as the family home is a good idea, purchasing art as an investment is also a great idea. The two most common investment vehicles for the average person are property and shares. For the last few years, the stockmarket has been going “sideways”, that is, neither up nor down. Fortunately its volatility now is less violent than in previous months, but performance is generally lacklustre. Residential property has been appreciating at 10% per annum over recent decades but has dropped by 5% – 7% over the last 12 months. A third asset type is “collectibles” and in particular — art. Good art will appreciate, unlike a motor car which may drop in value by many thousands of dollars as it leaves the showroom. 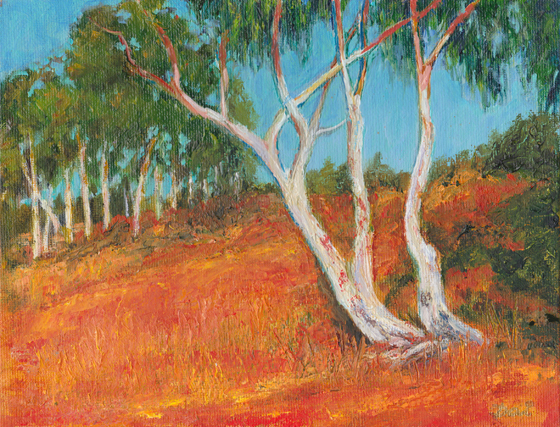 Good art is a legitimate asset for a superannuation fund, recognised by the Australian Taxation Office. The best thing about an artwork is that it can be enjoyed by owners and admirers alike. It also speaks for the tastes of the owner as it complements the furniture and interior design of a home or office. It is a physical, tactile object with a lot more appeal than share scrip. And good art appreciates in value. Yes, I know. This is a very common theme in artists’ ‘blogs. From a business point of view it is very important since it forms the basis for a successful professional career. For many artists who are supported by working partners, or are financially independent, or have a scholarship, money may be a secondary consideration. Many commentaries I have read are quick to advise artists to charge an appropriate amount for their artworks, and not to undervalue their time and labour. I have seen reference to standard labour market hourly rates and I would be ill-advised in this ‘blog to make comparisons with similarly paid unskilled tasks. When an admirer asks you, “How long did it take you to paint that [picture]?”, what do you say? Is this a subtle way of estimating the intrinsic value of an artwork, by multiplying hours by dollars? For those of you who place yourselves in the “professional” category rather than “amateur” or “hobbyist” and are therefore liable to pay income tax and/or value-added taxes, what do you tell your tax department? How does your annual (or quarterly) tax return read? Tax minimisation requires you to detail your legitimate costs in the production of your artworks. What are these legitimate costs? 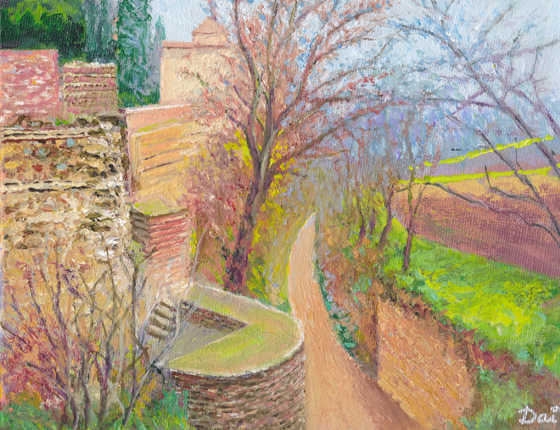 I am an Australian living in Melbourne with a penchant for painting landscapes of European cities and rural areas about 30 hours distant by air from my studio. I believe that a painting of mine should be original in as many ways as possible. No, I did not sit on a stool in front of an easel at a particular European location, as many admirers ask. It’s a delightful thought, thank you, but there are other places to visit and time is short and the train/bus leaves in an hour. Instead, I photograph the location, often from multiple angles. (This helps to identify it later with the help of Google Maps). My photographs are original because part of my skill is to compose the scene. Whereas a professional photographer may choose a location then wait hours, days or months for a particular moment – a sunset, a dramatic cloud formation, an early morning mist, or an open shutter night shot – I have the ability to interpret the image of a scene by painting certain elements and ignoring others. Most importantly, I have travelled to an exotic location for my visual material. This will require expenditure on an airfare, accommodation, surface transport and per diem costs. Agreed that digital photography allows me to take several hundred images at the one location, any or all of which could be the subject of a painting. Clearly, I cannot amortise all my costs over a handful of artworks, but some fraction must become part of the value in each painting. Then, there’s the cost of materials – stretcher bars, canvas, paper, paints, brushes, solvents, etc. If I sell my paintings at an exhibition, there will be entry fees and costs to transport the works to and from the gallery, not forgetting commissions and gallery hire. So, to talk about pricing a painting based on time and materials is rather simplistic. WYSIWYG — Seeing is Believing? Almost everybody I know, when quizzed, says that art needs to be viewed at close quarters before a decision to purchase can be made. 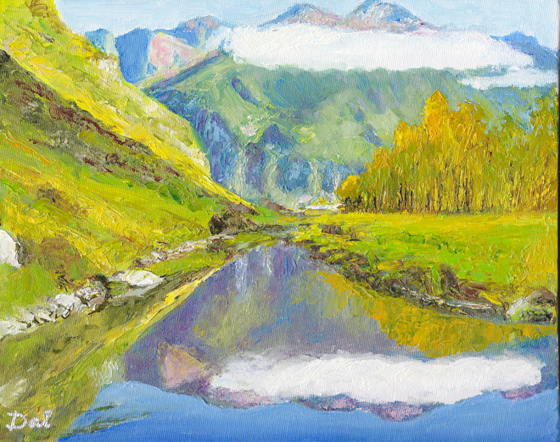 Yet a high resolution digital image on a high definition computer display will pick up every brushstroke and every paint dribble in full living colour. A painting is a hand-made creation and is therefore imperfect by its very nature, so any suggestion that an attempt has been made to disguise a “flaw” is nonsensical. There may be a valid argument that a painting frame has been chipped or that a glass has been scratched, but these things are peripheral to the work of art they display. In many cases, the presentation of the painting will be upgraded to meet the personal tastes of the purchaser, and the original frame and glass will be discarded. At this point I should emphasise that I am speaking of artworks with a market value of $1,000 or less — not Italian masters or French Impressionists. In the latter instances, the frames are almost as valuable as the paintings they surround. In Australia there is a current debate about the parlous state of the general retail industry and the effect of online sales on High Street shops. Naturally there are people who are a standard shape and who can confidently buy shoes and clothes off the online peg, so to speak, and others who simply have to try on the goods before committing to buy. Then there are thousands of items available on line for which an image or a written description is sufficient. I note that there are currently attempts in some jurisdictions to force advertisers to disclose whether digital image enhancement (“air brushing” for example) has been used to embellish a photograph of a good or a person. We all know the tricks of the trade when photographing food for publication. The presentation is certainly not edible. But I would vigorously argue that a high definition image of an artwork is WYSIWYG — “what you see is what you get”. Now, I understand that the purchase of original art is a somewhat richer experience for some than buying a pair of shoes or a raincoat. While we may not have an overwhelming desire to meet the Italian makers of our new Ferrari sportscar in Modena, we would love to greet the artist who embedded a small part of his soul in our sub-$1,000 artwork. It simply stands to reason, doesn’t it? And, if the creator of this unique and original piece of art is geographically distant, we can build a virtual relationship thanks to social networking on the Internet. So, doesn’t it make sense to consider buying a modest artwork, infused with the soul of a living artist, redolent of the passion for the creation of beauty, original and unique in a world of me-too, and likely to appreciate in value with the passing of time? Buying online offers a choice as wide as the world, with no taxes, no middlemen fees, no gallery commissions, minimal freight costs and quick delivery. I, for one, offer a money-back guarantee when unwanted goods are returned in the condition they were sold. Buying small, inexpensive artworks online is no riskier than buying other commercial goods. Remember that the Internet allows you to get to know the creator of your original and unique purchase — in person, albeit virtually in many cases. That’s not something you can generally do with other online purchases. And, finally, nobody can afford to damage their online reputation. Bad news and negative reviews travel at the speed of light on the Internet. My limited experience with open art sites has been less than optimal, in that any hint of controversy is immediately stifled. Dear Reader, you may have noted my crude attempts at being perverse, in the non-sexual sense, trying to engender an open debate on the online marketing of art. Clearly, I have conveniently forgotten that, unlike FaceBook, website ‘blogs are lucky to elicit a 5% comment rate. I am an ardent believer in the power of the Internet and its future in the marketing of original art. This is partly due to my former life as an electrical, communications and computer engineer where I find great satisfaction in the technologies of online presence. With the assistance of the tools of social networking, I can hope to build buyer confidence and trust by revealing myself as a real person with all my attendant human foibles. I was speaking at length yesterday to a photographer who wrestles with the same buyer perceptions as I do. He also agrees that, GFC and European debt crises aside, much of his buyers’ hesitancy is a result of nervousness in purchasing something unique where the value is not immediately evident. Often not even to self-proclaimed art critics. It’s not like a commodity item such as an iPhone or an SUV where everyone else has one and there is some actual practicality provided. You cannot request three competing quotes and check the boxes in features tables. It’s often a leap in the dark. It’s deciding with your heart and not your head. And, unlike the big electronics or motor car companies, there is no persistent advertising campaign instilling in your sub-conscience all the persuasive bullet points (“four cup-holders, walnut trim, bi-xenon foglights”) for buying something you don’t really need. Evidently there are success stories in the marketing of art online and in the development of a fulfilling career. 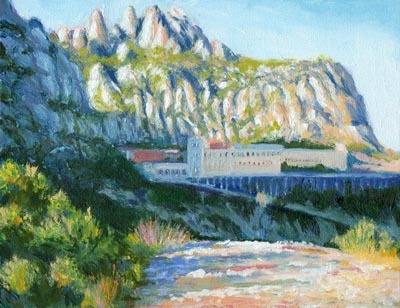 Julian Merrow-Smith in a small village in Provence in the south east of France would appear to be moving from strength to strength. As a member of the “Painting a Day” movement which includes Duane Keiser in the USA, Julian paints small oils on gessoed card and auctions them on his website http://www.shiftinglight.com Subjects vary from rural landscapes in vineyards surrounding his farmhouse, to still lives when the weather closes in. I sometimes follow the 24-hour auctions (he has developed his own auction software) and he regularly achieves USD300+ on each item. He also operates another site at http://stillives.com and paints slightly larger stretched canvases at USD2000. He has published two small books of works and included a potted history of his career from a movie projectionist in the UK to an artist in France. 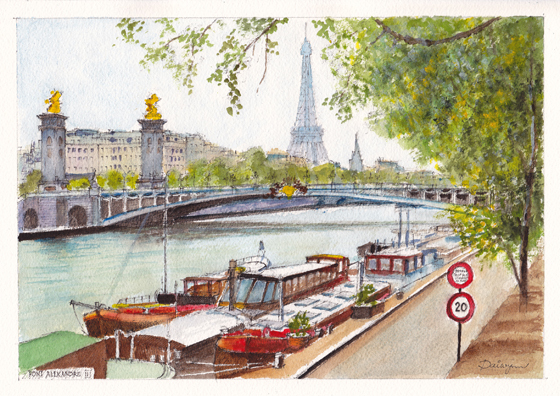 He also prints and sells giclées of his larger works. Apart from his excellent draftsmanship, Julian is an entrepreneur. His wife, Ruth Phillips, a concert cellist, assists in the very successful social networking side of the business. Their farmhouse location in the vineyards of Provence and in the shadow of Mount Ventoux is the stuff of dreams for his American audience, despite the unpredictability of the Internet connection, the freezing Mistral winds, and the fire which destroyed their house 10 days ago. His followers love to view the unfolding of the seasons in the region as depicted in landscapes, skyscapes and still life paintings of market and neighbours’ produce. He summarises his progress as commencing with 3 followers, blossoming to 3,000 after an article in the N Y Times Art Supplement, and increasing virally to 30,000 today. I have unashamedly tried to emulate Julian’s online success. 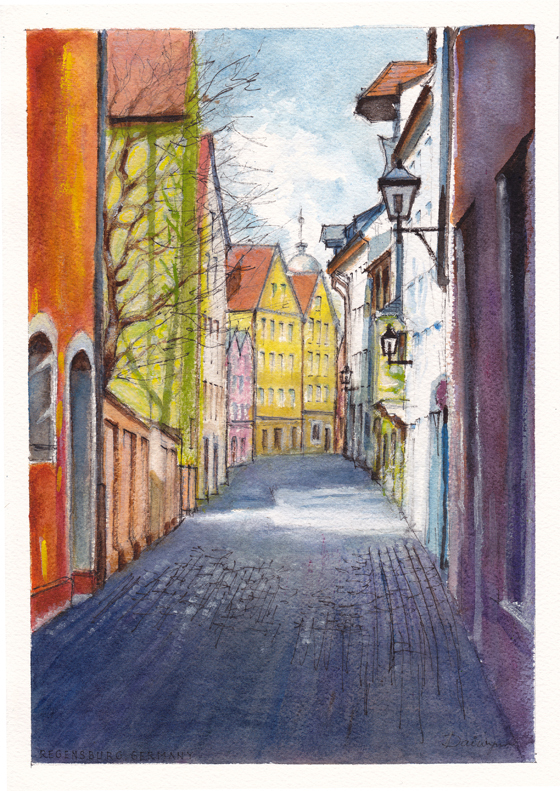 I send out an image of a small painting twice per week using PHPlist software with self-subscription facilities. This is linked to a WordPress ‘blog with the same image, but allowing comments and containing a PayPal “Buy Now” button. I recently set up a mobile-friendly, Flash-free, small format, low-resolution website for iPhone and Android devices. All websites have been optimised for search according to Google’s criteria and all contain XML site maps including image references. I monitor statistics using Google Analytics and Google Webmaster tools. I have had a brief encounter with AdWords, but am not prepared to pay for tyre-kickers. I receive frequent spam comments, Ugg boot and Viagra promotions, despite ReCAPTCHA on WordPress, and spurious attempts to subscribe to my eNewsletter using automated software. Unfortunately, very few bona fide subscribers. According to some statistics, my online presence is moving from strength to strength. When I Google myself “Dai Wynn” I occupy almost all of the first four pages of results, and over 100 in total. But, of course, one has to know who I am first. As a matter of interest and following a recent comment, I just Googled the phrase “Buy Art” and I have two results on page 1 of Google.com.au at unpaid items 12 and 13, just after eBay. That is of 174,000,000 results. Unfortunately I am suffering “statistics fatigue” this Monday morning. I believe that my expectations are reasonable and that I don’t have an inflated opinion of my capabilities. There is a huge room for improvement in all aspects of my endeavours. Often the main challenge is to remain positive about everything I do, including writing ‘blogs. My loving wife would say that I should always embrace a “generosity of spirit” — a literary smile if you like. I just stress over that common TLA (Three Letter Acronym) “ROI” — Return on Investment. That minor procedural step of turning hits into dollars. Dear Reader, I’ll be upfront and honest with you — I want to sell my art in a professional and businesslike manner. I know you’re taken aback and may take a while to recover from the shock, but I am determined to exchange my artworks for filthy lucre. (“Lucre” is defined as “shameful profit” and I’m proud of it). As I go about my daily life, I buy goods and services from dozens of people and companies. I don’t know why, but I expect excellent service. I am a stickler for expecting companies to answer the telephone promptly and efficiently when I call. I believe my well-reasoned emails should merit a response within a reasonable time. I take the view that the machines of industry should be well oiled and that business should proceed in a prompt and efficacious way. I’m more than a little cranky when goods and service providers let me down. Then we come to art. I paint pretty pictures. You have money and like original art. Let’s do a deal. You have to be smoking weed. It doesn’t work that way and, even in this Internet age with smartphones and GPS/Sat Nav, the tradition lives on. Art is different. One has to view the artwork “in the flesh” and to meet its creator “in the flesh”. This means an artist needs more than one channel to market. Bricks-and-mortar galleries still play an important role in selling art. I feel confident that a majority of readers will have dealt with gallery directors and curators. A strange sub-species of homo-sapiens. Apparently while sitting an exhibition, bored witless, they surf the web on their laptops trying to appear to be researching the artworld online. (They have yet to discover me). This takes up so much cerebral effort that they are unable to respond to emails or to answer the telephone. Or perhaps technology has developed an “app” for their smartphones that flashes “newbie artist” whenever I try to call. Having completed Probability Theory 101 at Art College, they know that the chances of a “newbie artist” selling out his exhibition on opening night is infinitesimally small, so the phone goes unanswered. Don’t try to get me started on dressing like an artist. Now that almost everyone is covered in tatoos, has body piercings and streaky hair, I’m not even going to attempt to differentiate myself. That said, I did see a gallery director type wearing a business suit, lace jabot and bright red “pope” slippers last week. Then there’s a little issue of my nebulous “artist statement”. I believe that my former life has equipped me well for a juxtaposition of technology and creative art. Nice word is “juxtaposition”. I should also try to interweave the words “spiritual” and “healing” into my spiel. “Intersection” is also a favourite when taking philosophical pilgrimages. Of course my paintings talk to viewers and to each other in exhibitions. I can barely hear myself think for the inter-painting jabbering that goes on in otherwise peraceful gallery spaces. No, no, no. 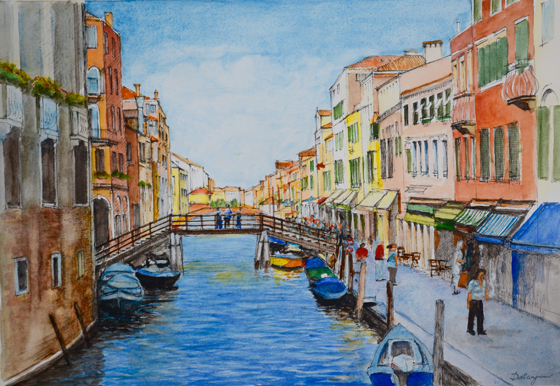 I simply paint pictures which I like and hope that others may also like. Period. Yes, I admit that I indulge my passion and enjoy my professional “work”. I know that’s generally a venal sin and that a large number of artists paint to wind down from a hard day at the abattoirs, coal-mine, recyclable rubbish sorting, or merchant banking. I don’t have a real job and for that I apologise, but could we just revert to the topic in hand? Do you like the painting? Is the price affordable? Do you have the money? Let’s do a deal! Yes, I take credit cards. Even American Express. According to ourmobileplanet.com, the penetration of mobile smartphones in Australia in 2012 stood at 52% and is increasing rapidly. This is higher than in the USA at 44% and vies with smartphone penetration in the UK at 51%. A smartphone is a device with a relatively large screen and capable of Internet access on the move. iPhones and Android devices predominate in this space. We are warned that users check prices and availability of goods and services online on their smartphones and will click-to-call when a “Call Now” button is placed centrally in the website home page. Last year, I developed a “Flash-free, mobile-friendly” version of my own website www.daiwynn.com on a sub-domain. www.m.daiwynn.com used the ubiquitous “m.” sub-domain to denote a “cut-down” version of a website suitable for loading and display on a hand-held device. Since Apple’s IOS operating system does not support Adobe Flash for animations and slideshows, images on my mobile site were still and of lower resolution for faster loading. Furthermore, the 320px X 480px screen of an iPhone tends to be viewed most often in portrait format, even though it can flipped to landscape for wider images. Buttons were large for multi-touch screen use, and text was larger for easy reading. 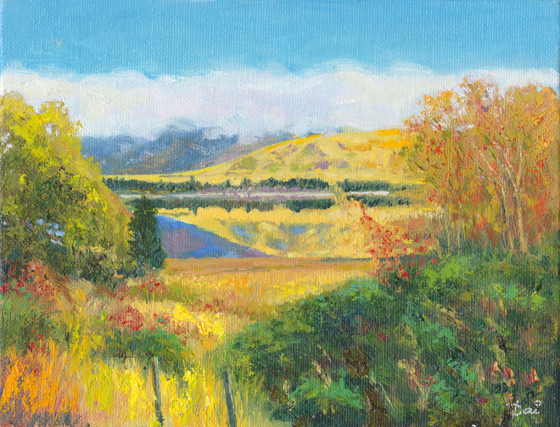 I had a simple home page displaying my weekly painting image, an “about” page with a simple artist statement, and a “contact” page with my contact details. I did not yet have a “Call Now!” button allowing a user to “click-to-call”. Needless to say, traffic on m.daiwynn.com was minimal. Depending on the mobile device (including tablets), the home page might appear as a postage stamp, or be cut-off at the edges. Assuming that users know about my mobile website, why would they want to view a tiny image of my weekly painting on a tiny screen? Isn’t art better displayed on a high-resolution 27 inch iMac cinema screen? And why would potential art buyers feel the urgent need to call then and there to conclude a deal? I suppose one could also argue, as I have done previously, that art is best viewed in close proximity, preferably hanging on a light-coloured wall within a metre of the viewer. And it may well be true that a potential buyer will use his/her iPhone to determine the location of that wall. In a determined effort to not second-guess the intentions of those mysterious potential buyers, I have invested time and effort in developing a “responsive, mobile-friendly, online shopping” website at www.daiwynn.com which adjusts to any size screen. This uses HTML5 for animation and slide-shows, and incorporates online shopping functions linked to PayPal. The result is that smartphones, tablets, “phablets”, laptops and desktops can all use the one website, daiwynn.com, and the software will optimise the viewing and navigating experience automatically. In this game, one never knows where that big cigar-smoking man in the white stetson hat is lurking. The idea that a potential buyer of art must see the painting before considering a purchase seems to have wide currency among the populace at large. There is general agreement that a photographic image — digital or analogue — is not an acceptable substitute for the real thing at close-up range. And, as an art lover viewing paintings at an exhibition, I strongly agree that even modern image reproduction processes in exhibition catalogues don’t do justice to the actual artworks on gallery walls in front of me. But my paintings don’t bear a “Monet”, “Picasso”, “Dali” or one of a thousand other famous signatures, and they don’t bear a price tag with six or seven zeros, so I’m not sure potential collectors should be too precious about demanding to see a painting of mine “in the flesh” so to speak, versus an image on a website. In the last month I have sold a painting to a customer in Beijing, P R China for a not insignificant price. I have never met this buyer, nor had the buyer seen the original in Melbourne. However, I think it highly relevant that the art lover had already purchased six of my smaller works on previous occasions. 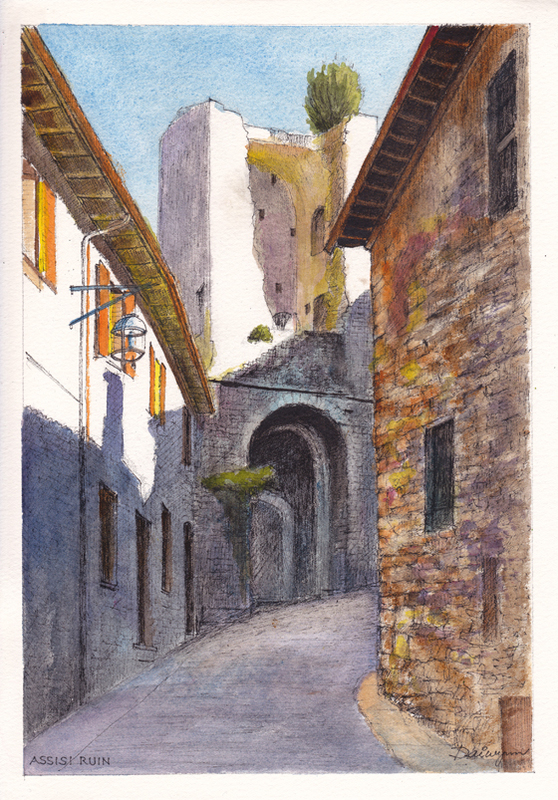 Firstly, a very small watercolour at a realistic price, was bought online but via my Chinese agent in Shanghai. So, there was an Mandarin-speaking intermediary who sanctioned the sale. I posted the well-packaged painting in Melbourne and it duly arrived undamaged in Beijing. Secondly, the same buyer later visited my Shanghai agent and bought five small oil paintings on the spot. So the buyer was now familiar with my painting styles and the quality of my work, as well as the integrity of the “supply line”. The most recent purchase of the larger oil painting on stretched canvas was an act of faith, given the money involved and the fact that the buyer had only seen a digital image. Transfer of money and currency conversion turned out to be fairly straightforward (apart from horrendous fees) and shipping the artwork raised no obstacles. Whereas I was fairly confident that I would be paid quickly (2-3 days), shipping is less predictable. I removed the canvas from its stretcher bars, rolled it and placed it in a strong cardboard tube, addressed it in both English and Chinese, declared its contents and a reasonable value (cost of materials), then posted it. It arrived within 10 days with no duty or taxes payable. So, in summary, once a benchmark has been set, albeit on a work or works of lesser size and cost, a degree of trust is engendered and a buyer can feel more confident to purchase a work online and remotely. The risk of physical damage before and during shipping applies to all purchases whether they be in person or online. Art is no different in that respect and, clearly, no insurance policy is going to replace a damaged canvas. Some artists would also have me believe that a painting needs to “talk” to the prospective buyer, and that the conversation cannot be achieved remotely. I’m afraid that I don’t subscribe to that hypothesis. I can only hope that I can convince others to “try before they buy”. My advice to them is to purchase a small oil or watercolour for an eminently reasonable price, before even contemplating buying a larger oil on stretched canvas. 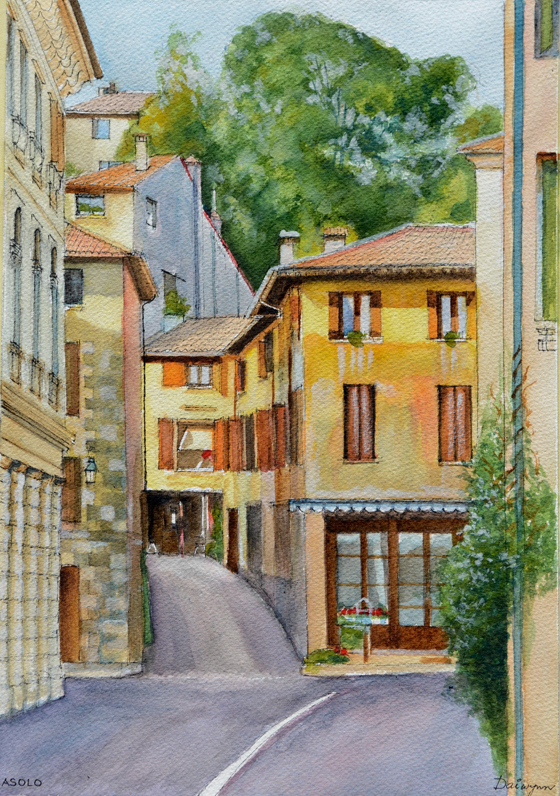 Given the proximity of Christmas and the “Holiday Season”, why not buy a small artwork as a gift? I would be the first to admit that everyone’s taste in art is different. That said, there are many artists — alive and dead — who command significant following. The French Impressionists remain hugely popular in part because their subject matter was generally non confrontational and concentrated on the prismatic make-up of light through the use of primary colours mixed on the canvas. Their popularity in the twenty-first century is measured in gallery attendances and prices paid for their better-known artworks. When the Impressionists were hard at work honing their new-found skills, their economic situation was generally dire, basically because they needed to create a market very different from that which prevailed at the time for serious works of art. Clearly, the constant rejection of their creativity must have been debilitating for years on end. I can only imagine how their wives and families must have pleaded with them to “get a real job”. I too frequently find myself in a guilt-ridden state, questioning my selfish decision to indulge my creative passions at the cost of a regular income. My fervent hope is that the Internet will change everything to do with art sales as it has elsewhere. Hypothetically, I can hawk my artistic creations around the world at the speed of light. There are online payment systems and shipping lines can deliver in days. My audience counts in the billions. In theory. While I too paint non-confrontational artworks, preferably of attractive landscapes and seascapes, I need to be reminded that only a small number of the world’s population likes what I do. Not even members of my own family tick the “like” box, because their tastes are diverse too. I was reminded today by a gallery director who decided earlier this year that, while “your work is excellent, it does not fit our aesthetics”. Not good for the ego, but oh well. It would be helpful to my marketing efforts to be advised as to what “does fit our aesthetics” in an open and honest manner. “Nice colours” really doesn’t do it for me, although I understand that good intentions are at play. My suspicions are that the non-artists among us don’t possess the vocabulary to critique an artwork, let alone offer a frank and potentially bruising comment if necessary. That’s the problem with political correctness — it really doesn’t offer any usable guidance. So, I’ll just paint subjects which please me, hopefully improving with time, and I will have to deal with my conscience alone. Time will also play a part in establishing a reputation. I regularly remind myself that I only need one customer per artwork. Now all I need to do is to stay sane while I locate those art connoisseurs. I would hazard a guess that many readers will have bought many items online in recent years. Did anyone buy original art online? If not, why not? Despite the apparent risks of using one’s credit card in the wicked world of cyberspace, I have bought airline tickets to holiday destinations without a thought. My online purchases, amounting to several hundreds of dollars, were for a vacation – a discretionary expenditure, just like original art. I don’t need to fly to an exotic location to survive. I need food, water and oxygen. Most people can live successful lives without original art on their walls. So, what’s the parallel here? Many people I have spoken to would agree that “art is different”. One can buy books on line, clothes on line, holidays online, airline tickets online, but art …… no, original art is different. One has to see the artwork “in the flesh” so to speak. What’s the main issue? Is it a matter of risk? Is it a fake? Is it fair value? Will it appreciate? Why does the signature “Mark Rothko” on a two-tone black-and-grey painting make it worth millions? Of course, as we all know, there is absolutely no risk involved in a budget airline flight to an exotic location. Well, perhaps if the flight has not been cancelled, it may leave late. The on-board service will be non-existent, and the seat will be cramped. We will have paid extra for our seat allocation and more for our baggage. We may arrive at our promised destination on time, assuming we have not been diverted, and our baggage may have arrived with us, and in one piece. I avoided mentioning earthquakes, floods, fires and civil unrest in our chosen destination — not to dwell on disruptions due to ash clouds from distant volcanoes. Did I talk about the airplane falling out of the sky? Absolutely no risk of that happening, is there? Then there are online auctions. OK, I think you get my drift. On the other hand, buying original art is REALLY risky. So, if buying original art is risky, buying original art online is simply out of the question. Clearly this is a cry for the advice of an “expert”. A potential buyer craves the considered advice of a learned curator in working out what to buy. Then the judgement call can be shifted to somebody else. Of course, learned art curators are generally found hanging out in bricks-and-mortar High Street galleries, not wafting around the Internet. A pity, because I have very high hopes for a successful online sales stream, based on my reputation as a legitimate artist. On two occasions I have taken up Google’s introductory free offer to try their AdWords product. Essentially one has to nominate a daily spending limit (I chose $10) and an approximate cost per click (around $1.30). Key words and key phrases were then chosen within the budget and with appropriate relevance to my artworks. While AdWords provides very good traffic statistics, Google Analytics showed me how much more traffic to my site was generated by various keywords and phrases. Whenever a key word or phrase was entered into a Google search, an advertisement, with words of my choosing, popped up on the results page. Its ranking depended on how much I said I was willing to pay per click. Clearly the number of clicks on my advertisement increased the number of hits on my website. So, if I limited my daily spending to $10 and the average cost per click was $1.00, I enjoyed 10 more hits per day. Hypothetically, these hits were better “qualified” than most since a person searching on my advertisement related directly to the keywords I had chosen. Normally, if I look at the huge list of keywords Google Analytics tells me have led to a site hit, I am often amazed at how random they are. One keyword that has sent hundreds of people to my website is “rainforest”. 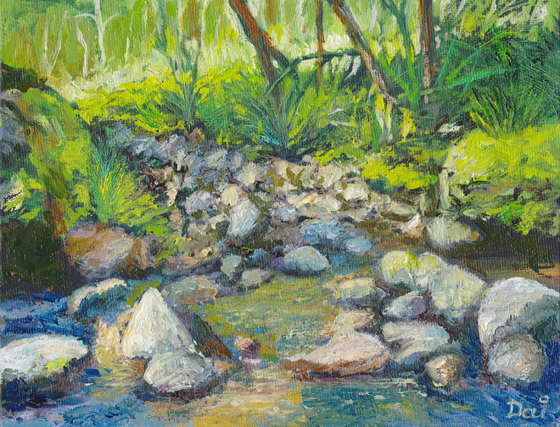 A painting of mine “Rainforest Stream” has featured as number one or two in the page of images categorised as “rainforest” — the rest are photographs. But a typical search could be on orang utans which live in rainforests — not on oil paintings of a rainforest stream. So, if Google AdWords delivers better qualified hits — people actually searching on “landscape paintings” for example — the return on investment (ROI) remains at zero. Now the experts at Google AdWords would sagely advise “No pain – no gain” which roughly means that I need to spend real money on an ongoing campaign, continually refine my keywords, be patient and understand the hidden intricasies of AdWords. Of course, no one can tell me how much I need to budget, how much detail I need to learn, how long it will take, and what my ROI will be. Does anyone out there in cyberspace have an AdWords success story? – The Society of International Artists. Based in Vancouver, British Columbia, Canada, this site was created by Englishman Colin Mansell who successfully ran online galleries in the UK. I was invited to join several years ago, so there was a sense of exclusivity in membership which was intended to be limited. Images of new artworks are vetted before appearing on the website. Membership is free but a limit of 40 images applies. Artsia also promotes an art print service which requires high definition images and also has a limit of 40. In the event of a sale, Artsia covers the costs for printing, shipping and handling before paying the artist 50% of the final sale price via PayPal. Artsia also encourages artists to post blogs on the site. Over two years there has been no activity from this site despite my regular posting of images and blogs. Benefits: Artist contributions are “juried” by “management”; the site is outside the USA and supposedly avoids the need to waive withholding tax as is required for US sales. Disadvantages: I have no visibility of online activity at this site. – A US-based arts and crafts site with millions of members. It costs US$0.20 to post an image which remains in one’s public “shop” for four months before it needs renewal. There is no limit on the number of images in a “shop” which can be customised by the member using logos and banners. Etsy membership includes an eCommerce function with payment by popular credit cards and PayPal. Shipping cost estimates and time to ship are provided by the member. I have not sold anything via Etsy. Benefits: Huge audience; professionally organised site; sales are organised by the member; good statistics give accurate audience reactions to members’ works. Disadvantages: Images are not vetted; Etsy is mainly a craft site; membership numbers are huge. – A US-based fine art site with a very large membership. Fine Art America is mostly concerned with the promotion of art prints which includes photographs. There is no limit to the number of images displayed in a member’s online gallery, but there is a limit on the number available to Print On Demand (POD) unless the member pays US$30 per annum for a Premium Membership. 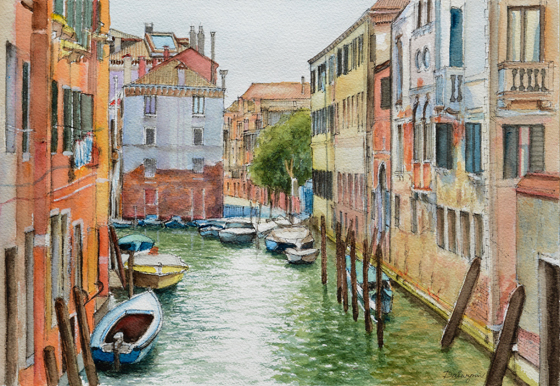 FAA takes care of all processes in the production and shipping of framed prints and pays the member an agreed commission via PayPal on the 15th of the month (provided the purchase occurs prior to the 15th of the previous month). Benefits: A very professionally organised and run site. Good viewer statistics. I have bought bespoke Christmas cards at a very reasonable price; I have received welcome print commissions without any effort on my part. Disadvantages: This is a very large site so expect some excellent competition. – An Australian company with a presence in the USA. Redbubble is in the business of selling prints, but seems to place most advertising emphasis on prints for T-shirts, hoodies, stickers, iPhone cases, iPod cases, iPad cases, kids’ clothes, posters, calendars, cards and gift certificates rather than fine art. Redbubble seems to place no limits on the number of images in a member’s gallery, and offers a convenient folder system for categorising paintings. It also offers an opportunity for the artist member to post a profile, résumé and artist’s statement. 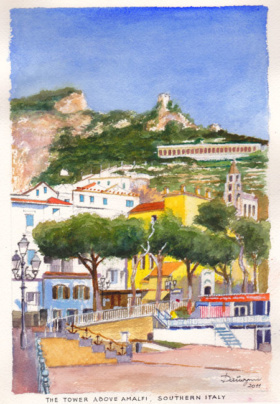 Benefit: Free membership; opportunity to sell prints; well recognised and innovative. Disadvantage: Oriented to prints for personalising clothing and accessories rather than wall hangings. – Originally based in the UK and a product of the well-known Charles Saatchi who owns the Saatchi Gallery in Kings Road, London, UK, Saatchi Online is run out of Los Angeles, USA. Saatchi Online offers original art works, prints, and miscellaneous items in its gift shop. Membership is free and the site is well organised and professional. Artworks offered by members for sale are well documented and members pay a 30% commission on works sold. In my case, the DHL courier costs from Australia to the USA were covered by Saatchi. 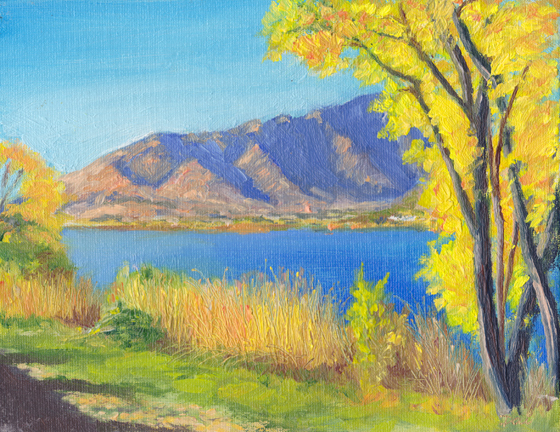 Benefits: Professionally run; competitions showcase some fabulous art; only 30% commission. Disadvantages: I had to fill out US IRS forms to prove I am Australian and therefore am eligible for a waiver of a 30% withholding tax under a bi-lateral scheme to avoid double-taxation; members need to be available to ship artworks within the time already stipulated (I was away from my studio for a week when a buyer unexpectedly bought a painting). – A creation of Melbourne web developer Ron Stark, Gallery247 provides a gateway to selected community art shows around Melbourne, Australia. Membership is free, but benefits are limited unless one pays a monthly fee for expanded features. Members place images in their galleries with details of dimensions, media, and price. As community art shows open their books to artists for submissions, members nominate images for possible selection. Gallery247 charges $5 per image submitted and a further $12 (or more depending on size of work) per artwork selected by each exhibition committee. Gallery247 has also invented a National Register of Australian Art and Artists such that each image is awarded a unique identification. Gallery247 generates PDF tags for artworks selected so members can print and attach bar-coded identification pieces to their artworks. Benefits: Gallery247 provides an in-depth information technology front-end to community art show organisers, most of who could not afford such comprehensive technology for a once-a-year charity event. Disadvantages: It would appear that Gallery247 does not update show organisers of changes to the availability status of artworks between the time they are offered by the member and the time they are selected for hanging in a show. This period can be two months. – This is one of those fashionable sites with no defined purpose. Membership is free and there appears to be no limit to the number of “boards” and images. Benefits: Pinterest displays the image source URL prominently and allows a price to be attached to the image. I am continually pleased when some random person favourites an image of mine on the same board as household-name artists under a board title such as “My Favourite Artists”. Disadvantages: One is lost in a sea of random images, most of which have nothing to do with fine art. – Google’s contribution to social networking. Benefits: “It’s Google stupid” and will supposedly eclipse Twitter and Facebook in the near future. The Archibald prize is the preeminent prize in Australia for portraiture. There are other valuable prizes such as the Doug Moran, but none occupies the same public media space. Call me old-fashioned, but I thought that the Archibald rewarded good portraiture. To my simple mind, a good portrait is well-executed with a high degree of painting skill, exhibiting not only an excellent physical likeness of the sitter, but also interpreting the intricate character of the subject. How naïve can one person be? My own personal research into the Archibald over the last decade would suggest that it is really an exercise into publicity for the Art Gallery of New South Wales. To command greater media presence in these days of information overload, the gallery has found it necessary to be as contentious as possible. Whereas the Packers’ Prize seems to be awarded to the most technically proficient portrait in terms of old school painting – that is, the work exhibits great skill in achieving a genuine likeness of the sitter – and the People’s Prize is determined in a similar manner, the Archibald is given to “something out of the ordinary”. Unsurprisingly, the winner is a media savvy artist who will effectively promote the goodwill of the Gallery for the following twelve months and has often done so in the past. I enjoyed the 2013 “Salon de Refusés” in the foyer of the South Wharf Hilton Hotel in Melbourne far more than the winner and short-listers in the Mornington Peninsula Regional Gallery. The former displayed some competent paintings, enjoyed in an uncluttered environment, while the latter showed a very eclectic bunch of artworks in an uncomfortably overcrowded gallery. Granted, some of the finalists are great portraitists in the classical sense, and there’s a lot to be said for a little wry humour here and there to temper pretentiousness, but does a letter to the judges with a small comic face actually constitute a portrait? I don’t have a problem with unconventional media – enamel on polished aluminium, acrylic on glass, oil on card, etcetera – but that should have very little bearing on the “portraitness” of the artwork. It seems that the intention of many galleries in these times is to leave visitors with more questions than answers. The viewer is challenged to leave the gallery and start a conversation with another perplexed viewer. “What was that about?” “I don’t quite know, but let’s talk about it”. 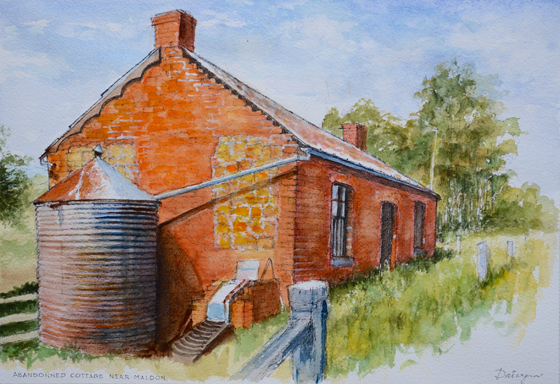 The Ballarat Gallery in regional Victoria has a mid-career retrospective exhibition of Robert Clinch works in a rear ground floor gallery (August 2013). Robert could be classified as a hyper-realist artist with perhaps a rather pessimistic view of the future. I met Robert Clinch in his Ashburton studio (a south-eastern suburb of Melbourne) several years ago, having been introduced by the son of Dr Joseph Brown, Robert’s patron. Three years ago I dined with Robert and his wife in a Paris restaurant in the company of Jeff and Annie Brown. 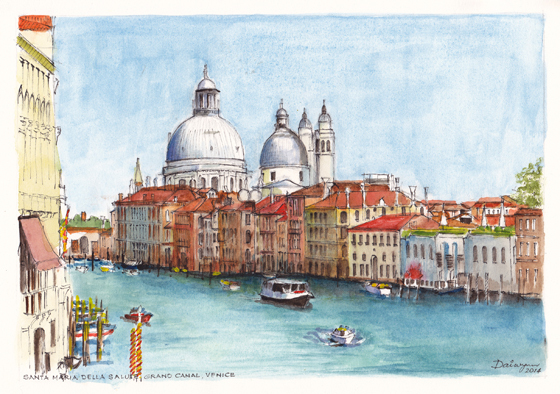 Clinch’s watercolour and egg tempera paintings are masterpieces in their own right. The detail in each work must be seen to be believed, down to cracks in bricks and rust on nuts and bolts. I seem to recall that larger paintings have occupied Clinch full time for up to 12 months, and it is not difficult to see why. There is absolutely no impressionism here – every “fly speck” is painstakingly revealed in über-photorealistic detail. I would go so far as to say that the micro-granularity exceeds the the average eye’s abilities to resolve many details. Clinch told me that he makes his own egg tempera “to last 100 years or more”, but unfortunately I was not privileged enough to see him apply his paints with the precision required to achieve such architectural detail. 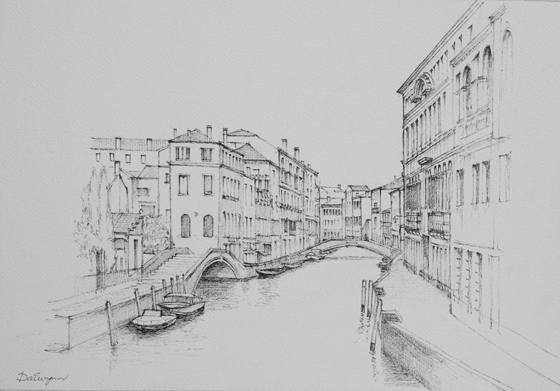 I am a great admirer of skilled draftsmen and Clinch demonstrates unparalleled competence in his working drawings. Each annotated “rough sketch” is in itself a masterpiece in its own right. The late Jeffrey Smart used to lament that too few artists were good draftsmen – a skill he thought was essential to execute a well-planned artwork. In this and several other respects, Clinch’s works reference those of Jeffrey Smart, so much so that Clinch landed a commission from trucking magnate Lindsay Fox to paint shipping containers (very reminiscent of Smart) and a Mercedes-Benz truck from the Linfox fleet in excruciating detail. Clinch’s works feature foregrounds of “industrial archeology” in gentrified decay against a background of Melbourne’s skyscraper skyline, often with leaden skies reddened by the pollution of unfettered industry. Many enjoy a juxtaposition of the old and new, with a little wry humour thrown in for good measure. For example, “The Reading Room” shows a young girl perched on wooden stairs at the rear of a late 19th century red-brick tenement. She is reading a book in sunshine, while in the middle ground is the dome of Melbourne’s State Library. Robert Clinch is the consummate artist whose approach to each artwork is absolutely meticulous: in the development of an idea, to the research of the subject, to the execution of the working drawings, to the mixing of special pigments, and finally to the thousands of hours of detailed painting in his studio. This was an exhibition I would have willingly travelled to Ballarat and back several times to see. Simply awe inspiring. ‘BRIC Expert’ David Thomas writes a regular review of emerging markets in his ‘Think Global’ blog (bricandchina.com/blog). In his September 16, 2013 blog he writes about ‘China’s Premium Market’ as the wealth management opportunity of the century! He talks about the premium class of consumers who form part of a new market of ultra high net worth individuals (UHNWI) that is truly out of reach for the majority. This opportunity is different from the ‘mass affluent’ market, referring to exclusive goods and services accessible to the masses e.g. Chanel handbags, Louboutin shoes, first class airfares, etc. Thomas is referring to a ‘premium market’ which is unattainable to 99.9% of the population. He writes of invitation-only experiences and events that are personalised and discrete. According to official statistics, China has more than one million millionaires and 122 billionaires and, within two years, will have the world’s fourth largest concentration of wealthy people. China is currently the largest market for luxury goods and by 2015 will account for one third of all luxury good purchases. China’s top five hundred wealthy people have a combined wealth of USD600 billion and an average net worth of USD1.2 billion. My personal hope is that, after many of these wealthy people have filled their larders, stocked their cellars, crammed their garages, and landscaped their palatial mansions, they will realise that their extensive white walls need to be decorated with …..